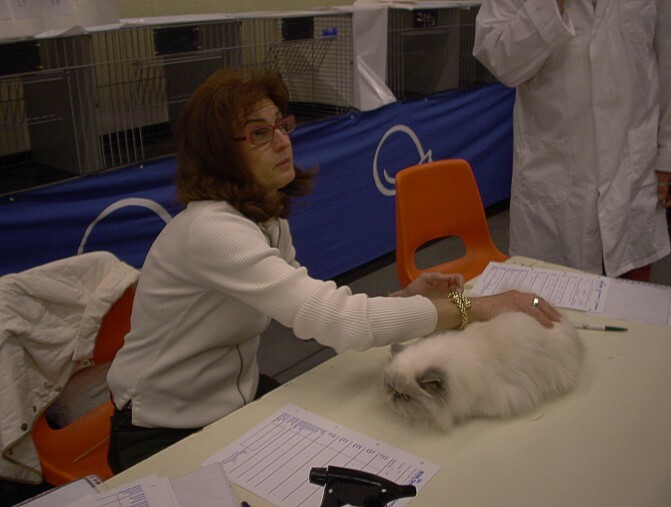 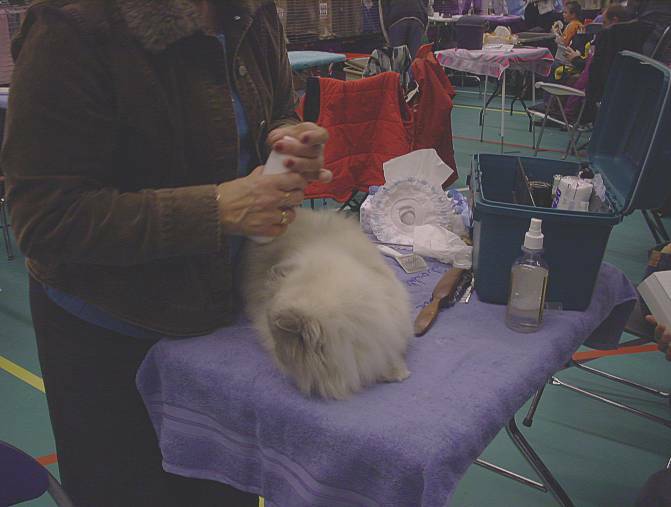 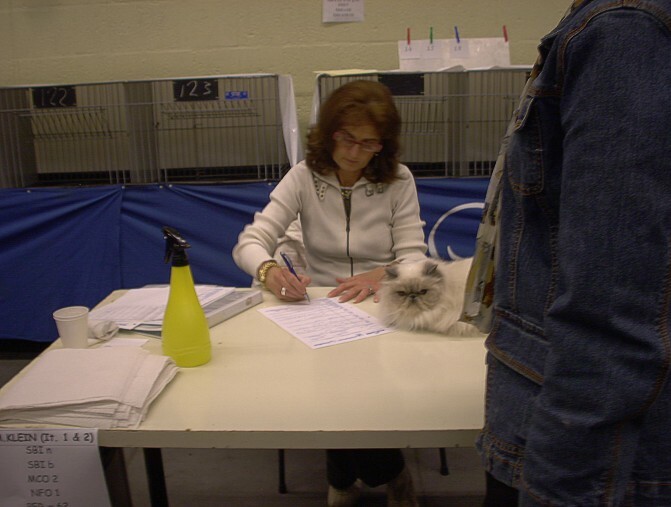 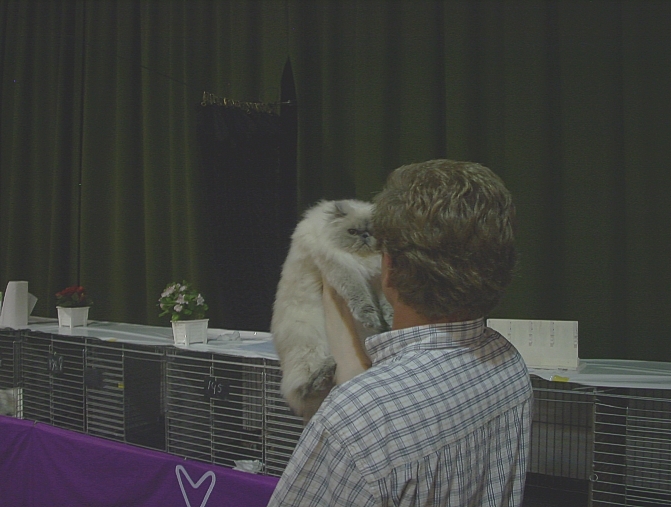 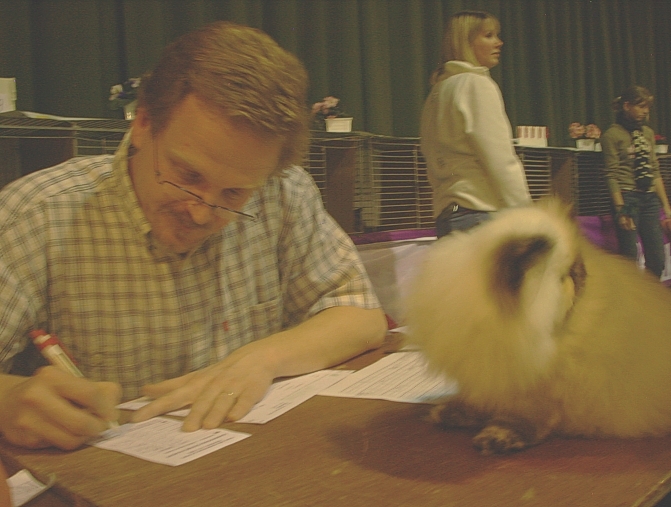 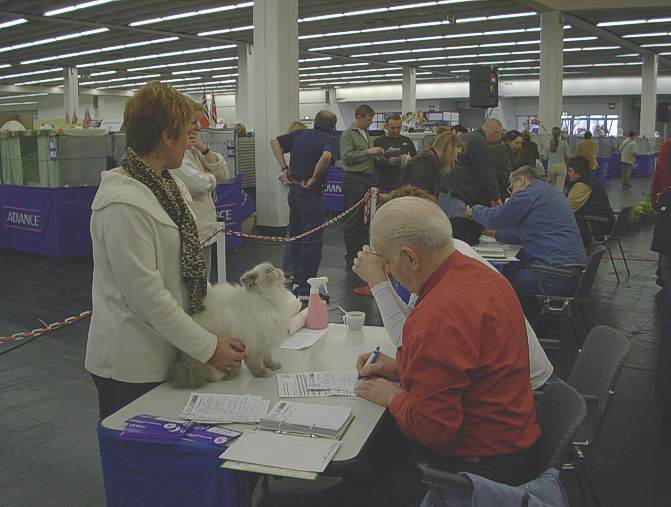 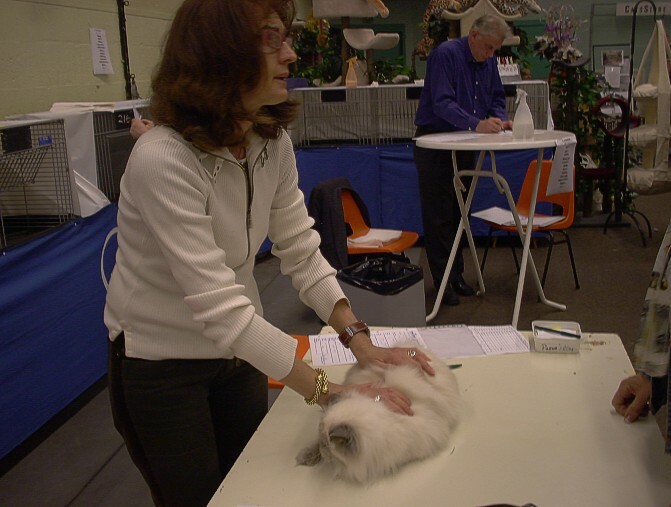 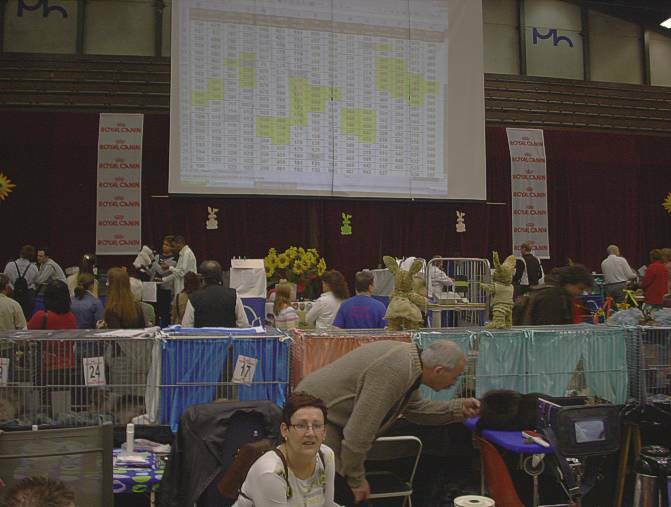 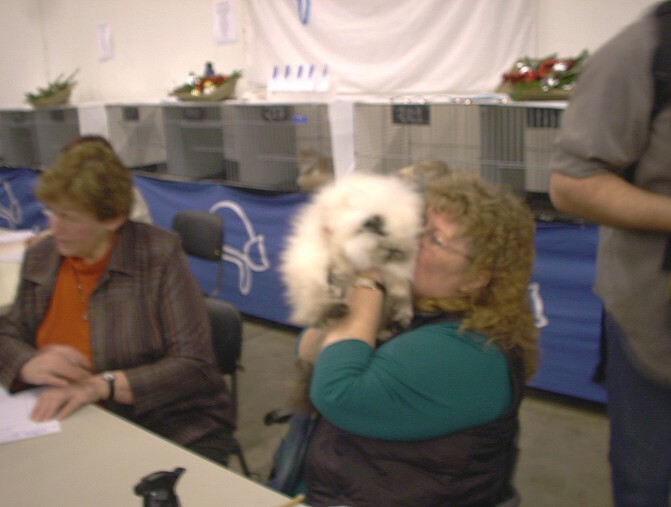 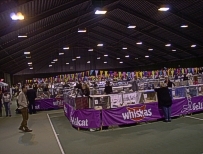 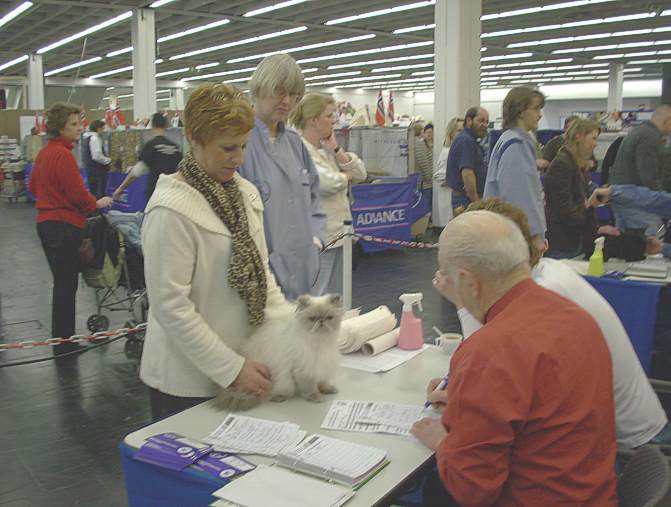 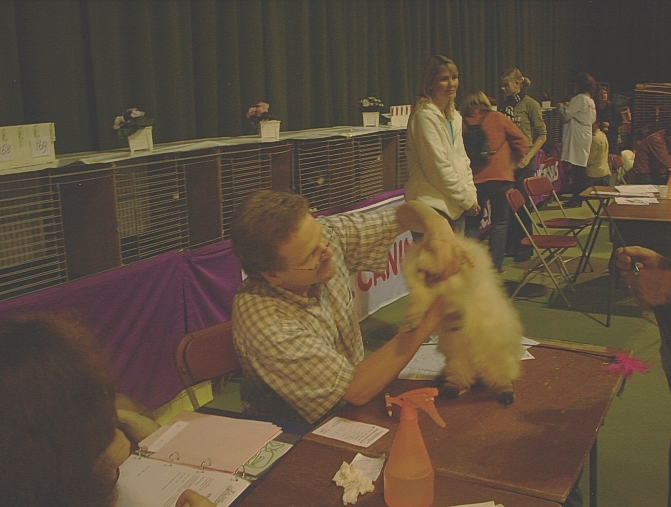 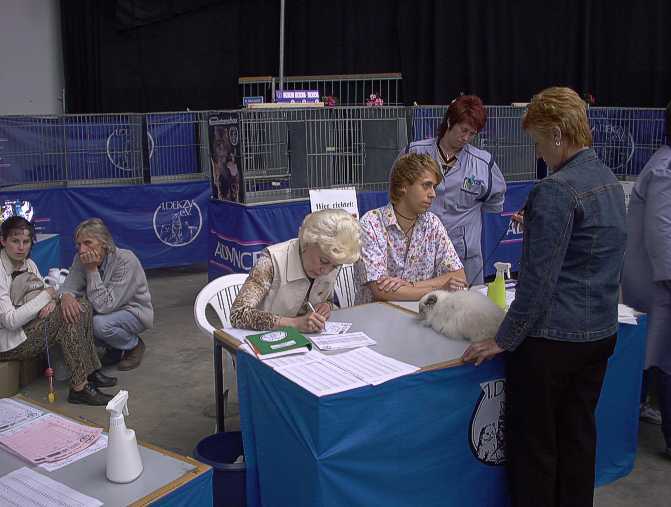 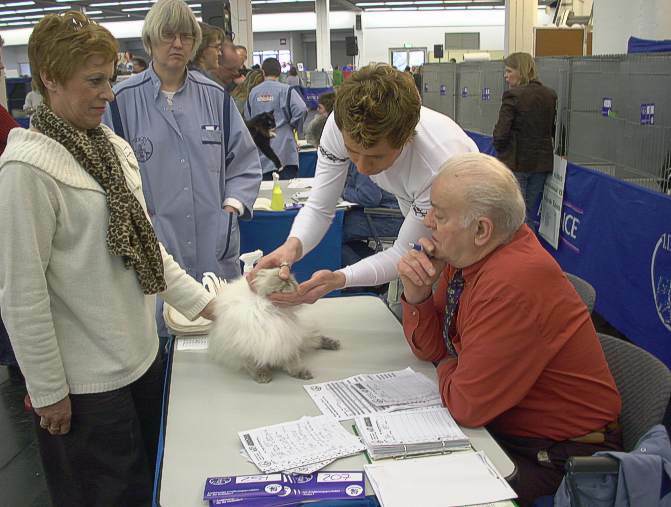 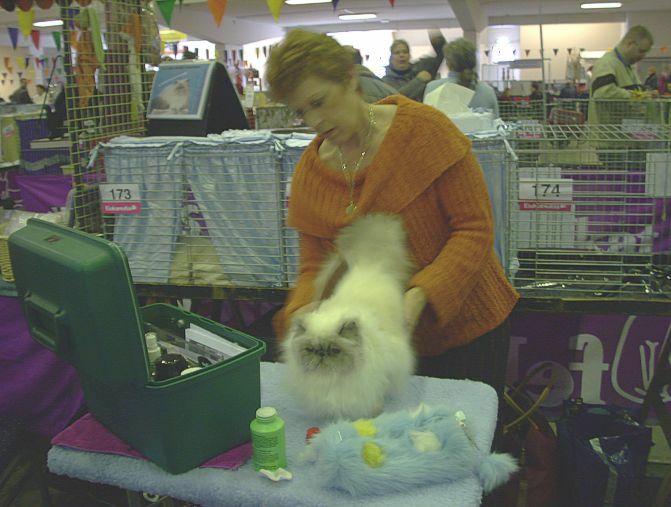 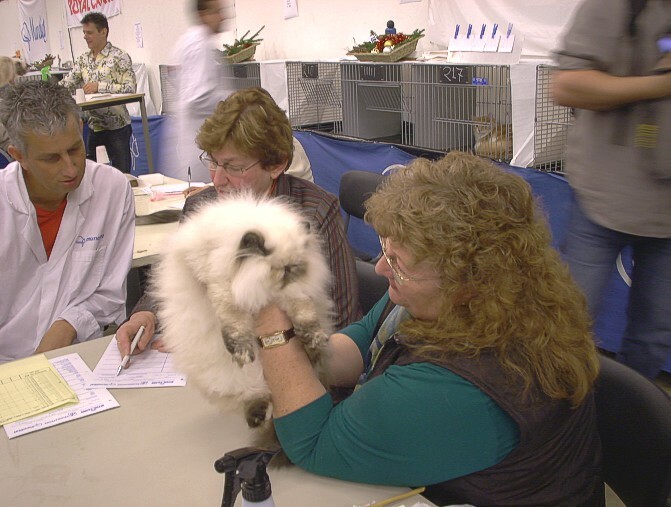 Romy grooming and wait for Judging. 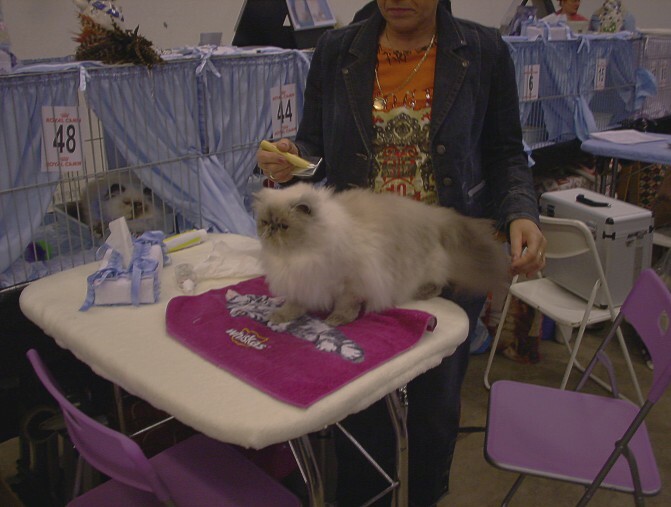 Romy by Judge Laura Burani from Italy. 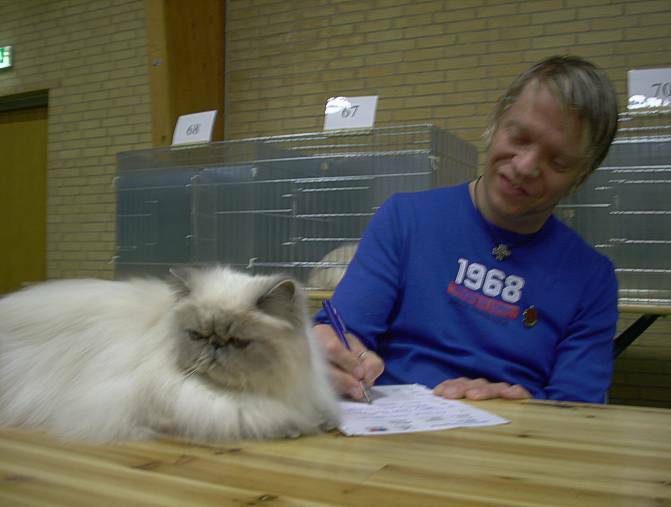 Ome Jaap has applecake with cream, super for Amy(she must to the judge!). 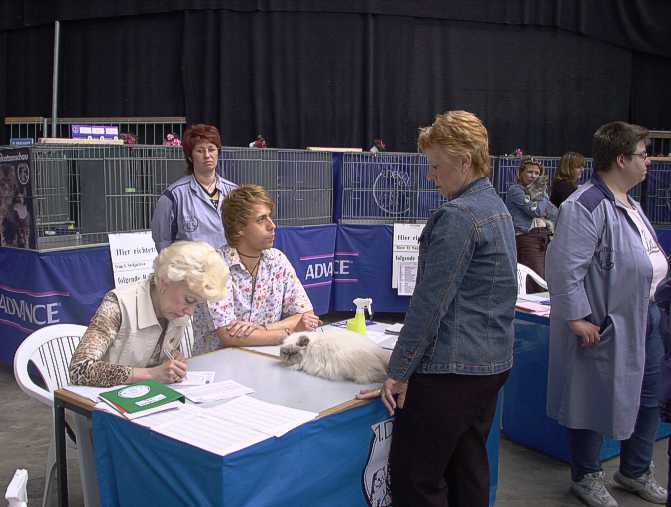 Waiting with Amy for Judging. 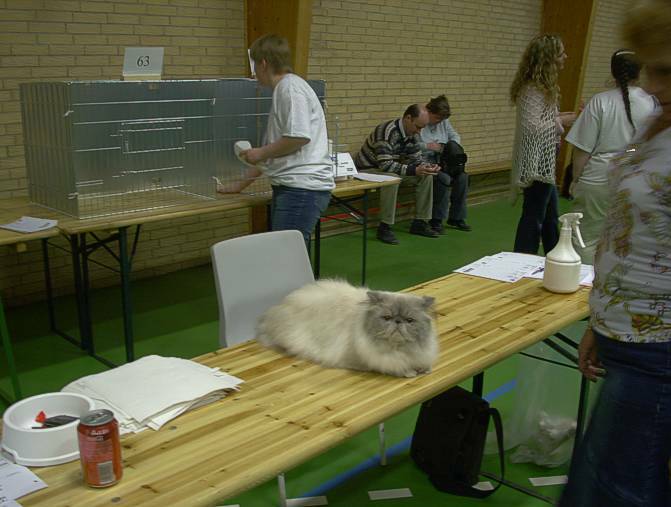 Amy by Judge Hanne Sofie Sneum (DK). 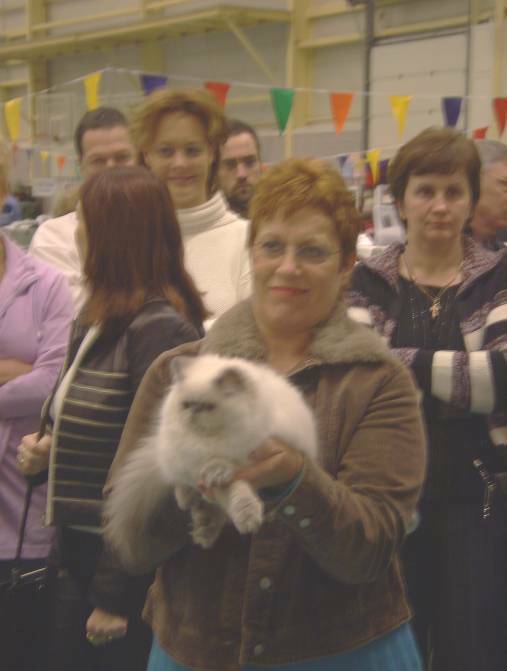 She was really in LOVE. 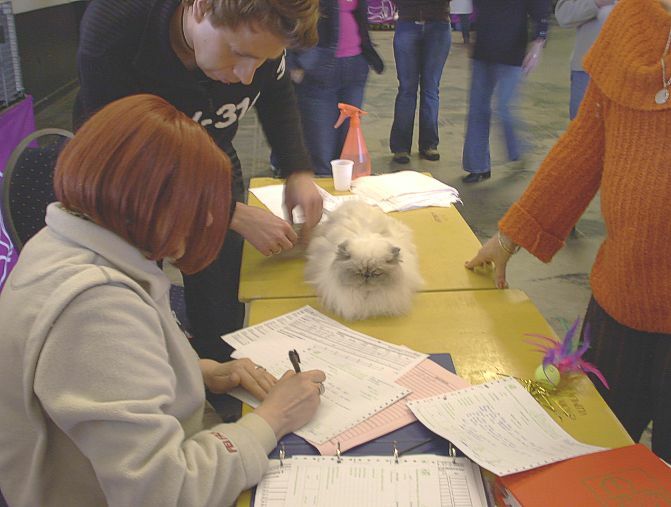 Sweet waiting op report from Hanne Sofie and her secretary Netty Bosch. 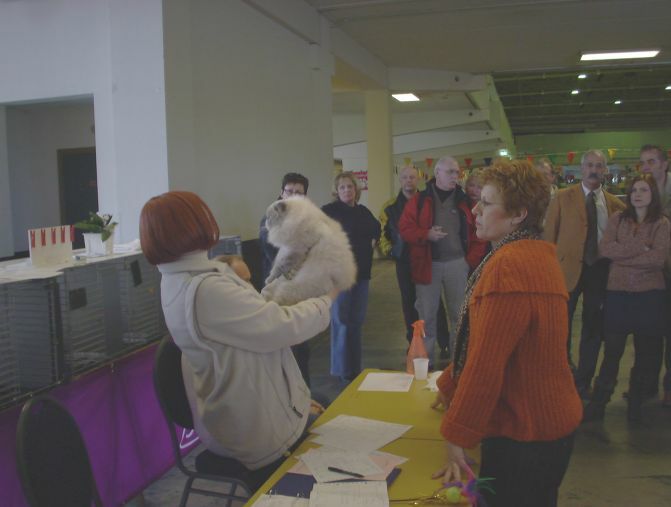 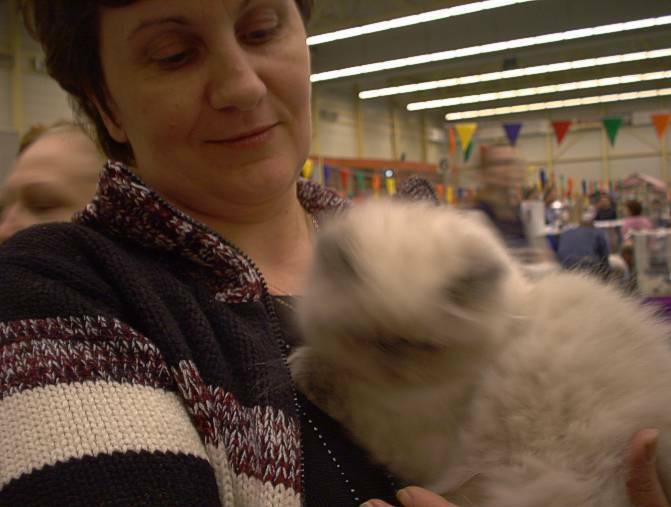 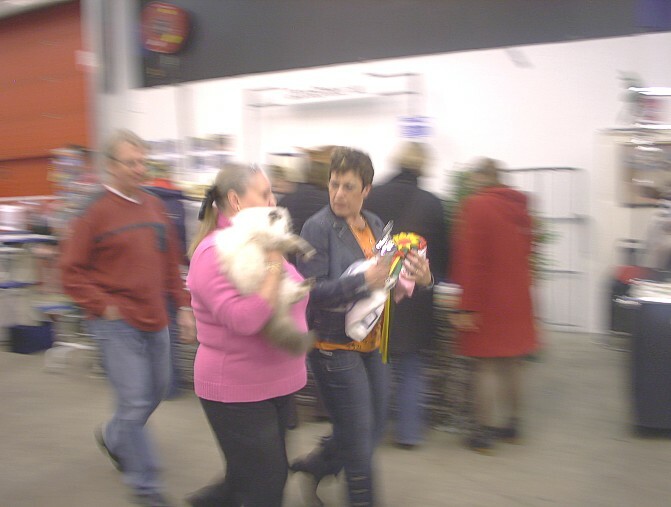 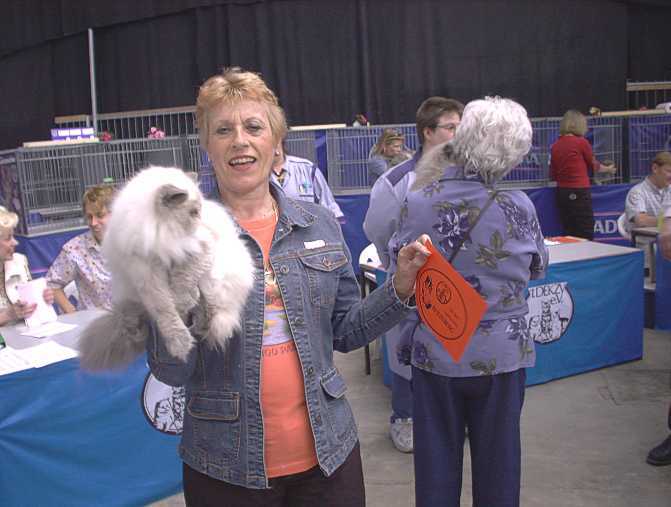 Yes Amy, she is BEST IN SHOW. 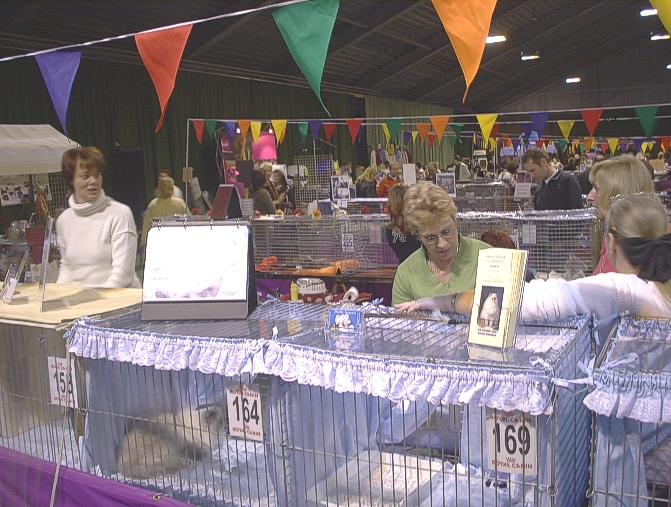 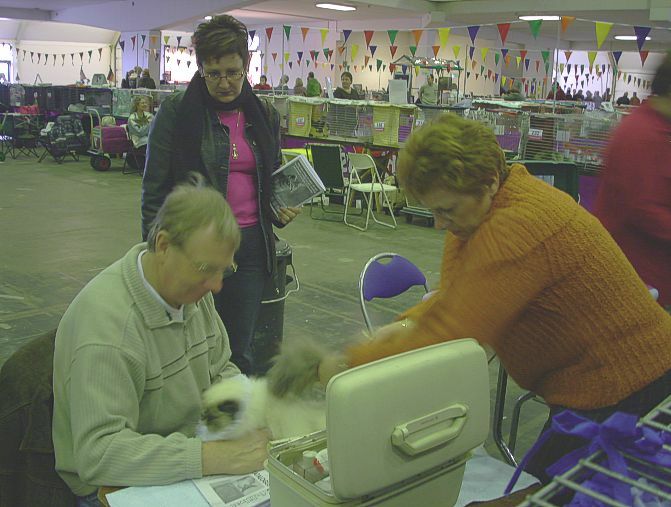 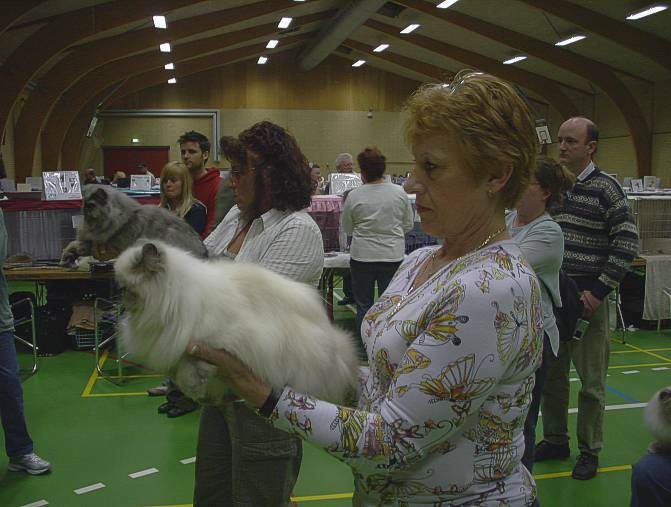 The proud breeder and owner. 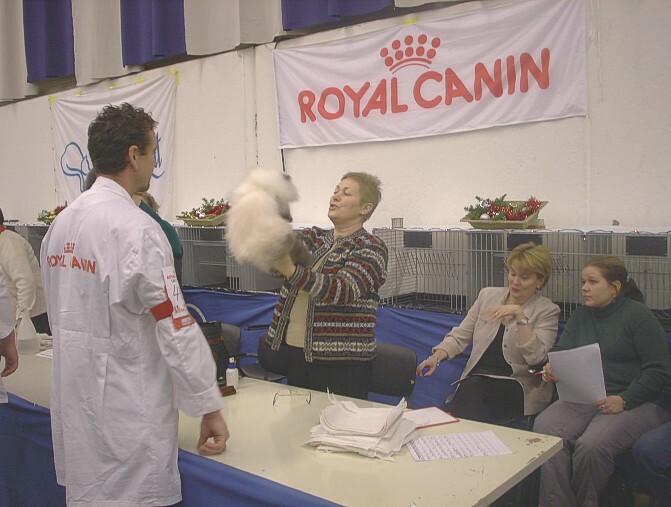 Fabrice Calmes our Judge from France with Romy. 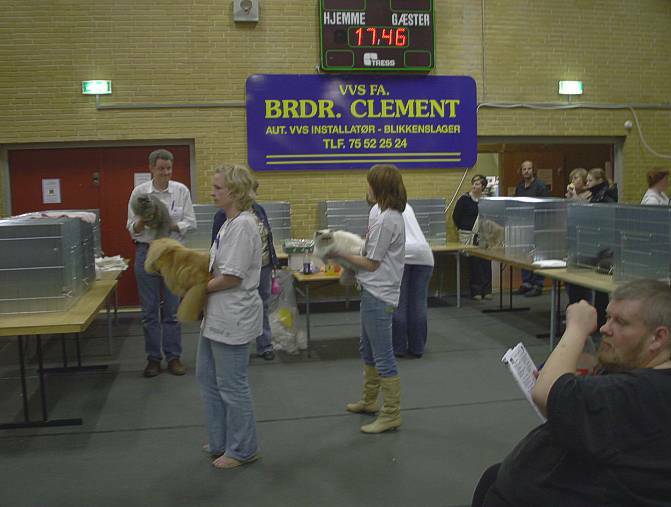 Romy, terrible light in the hall. 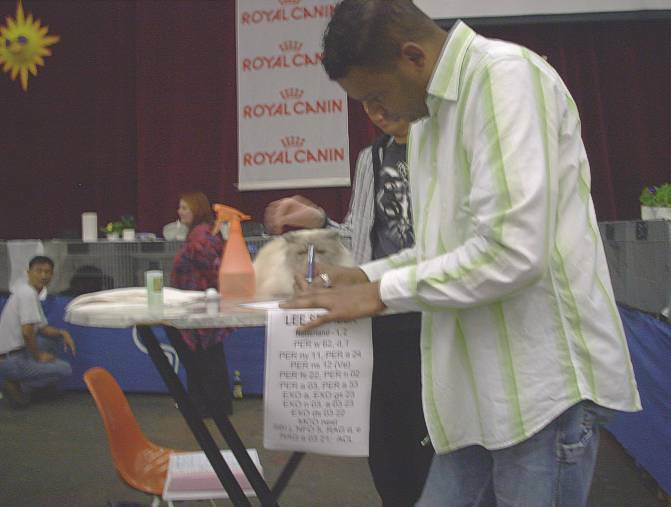 Romy, choice for the BIV. 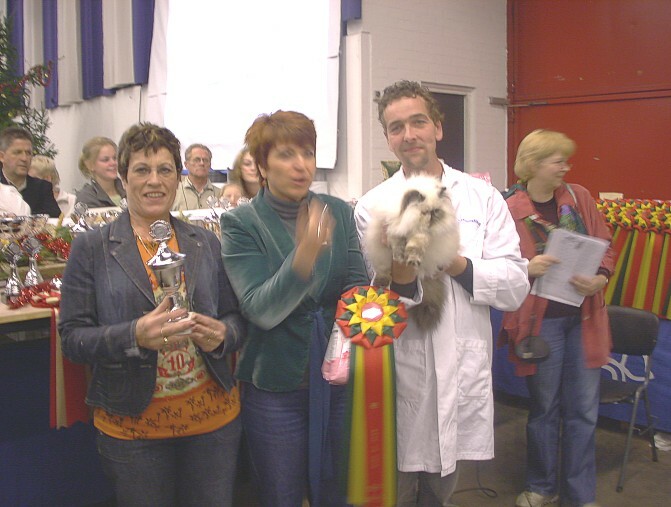 Our Romy Best in Varieteit. 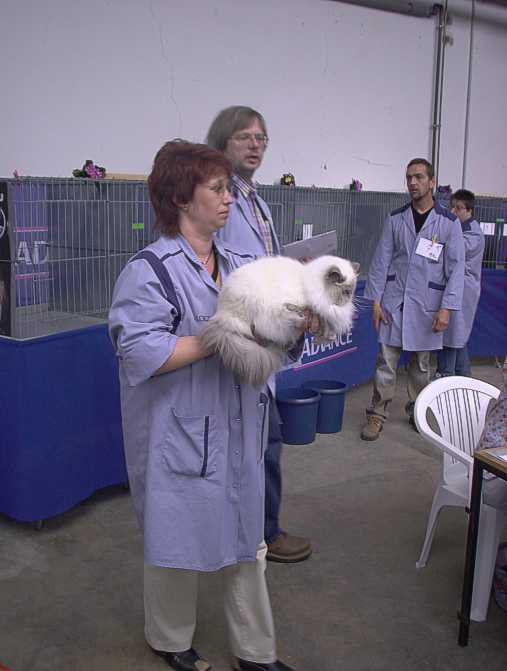 Amy, for the first time on show. 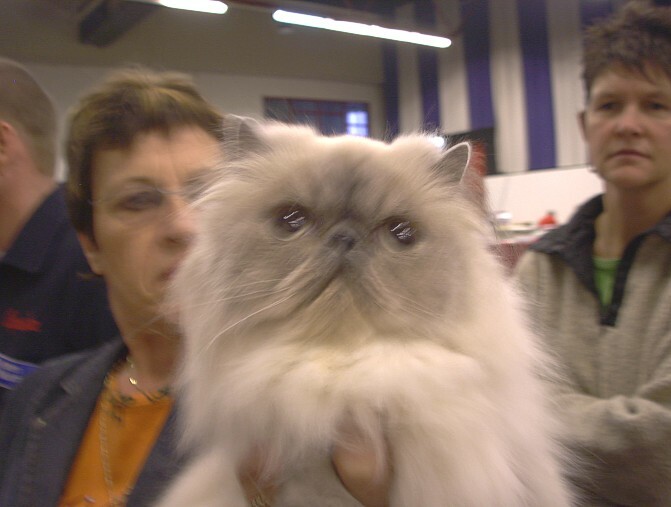 Look Fabrice, how beautiful (Here) I Am. 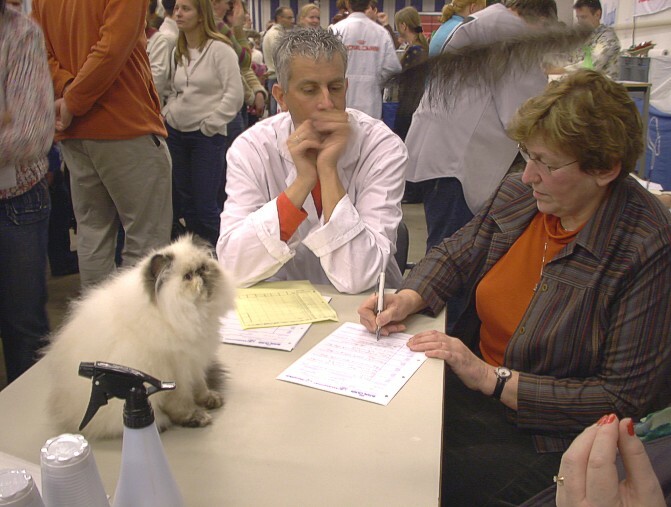 Where is the boss............ .
Mary (the breeder) is looks what the Judge is thinking. 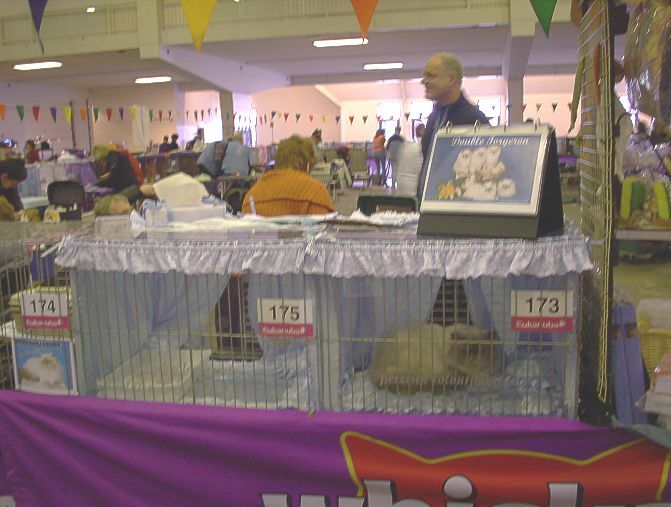 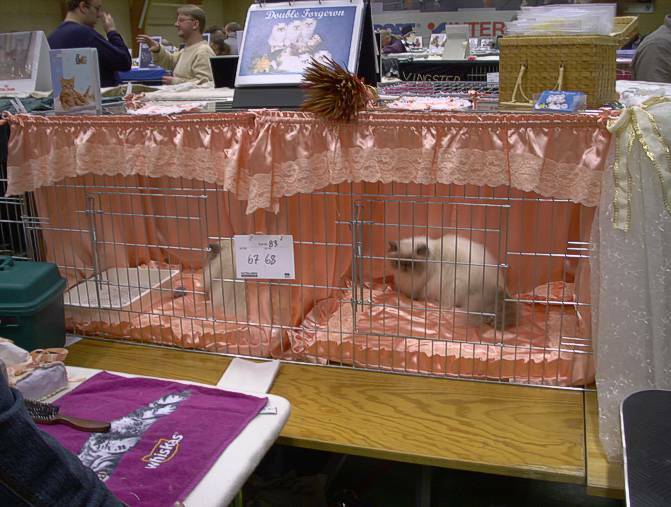 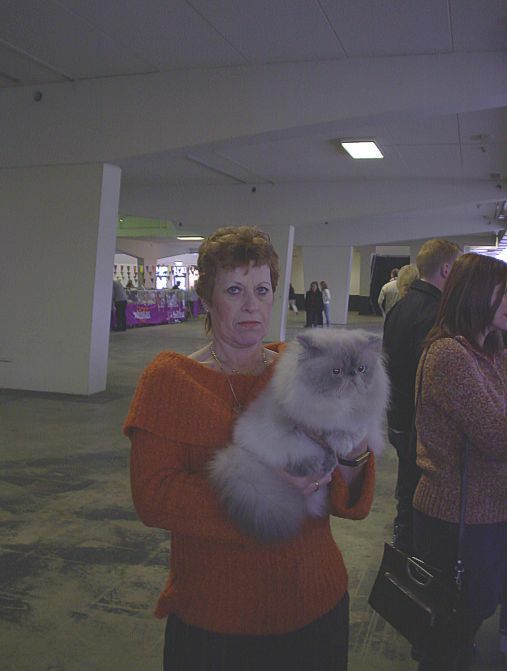 Choice for the best in show. 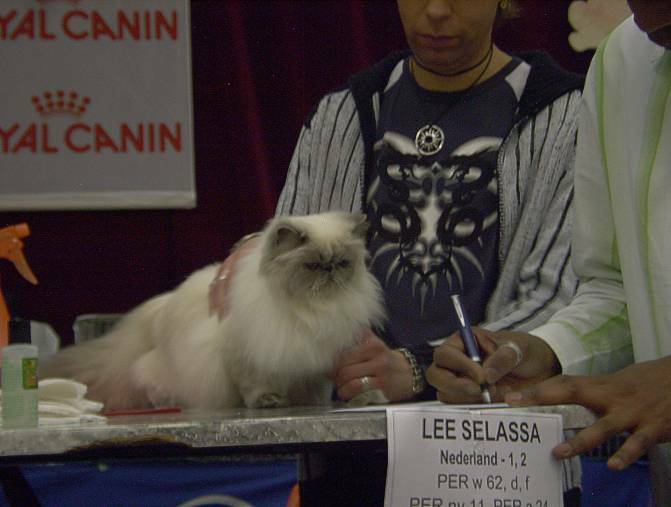 Mr Selassa choice's was the other cat . 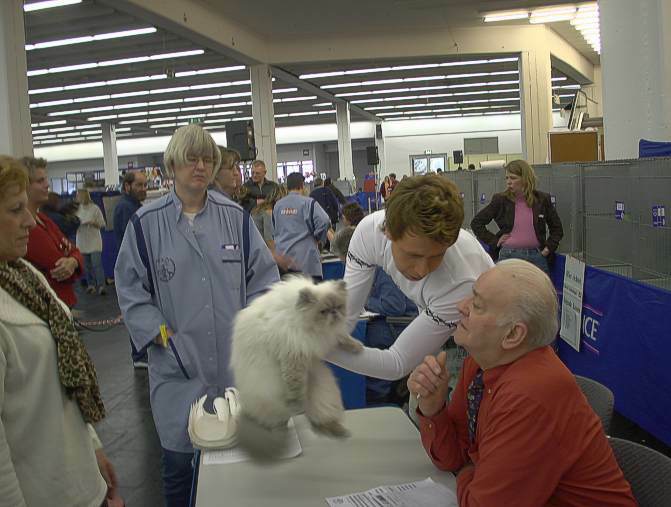 To the Best in show. 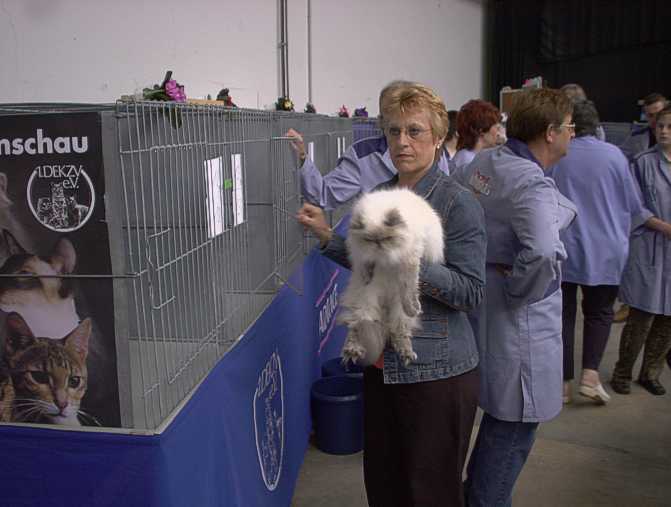 Waiting in the cages for BIS. 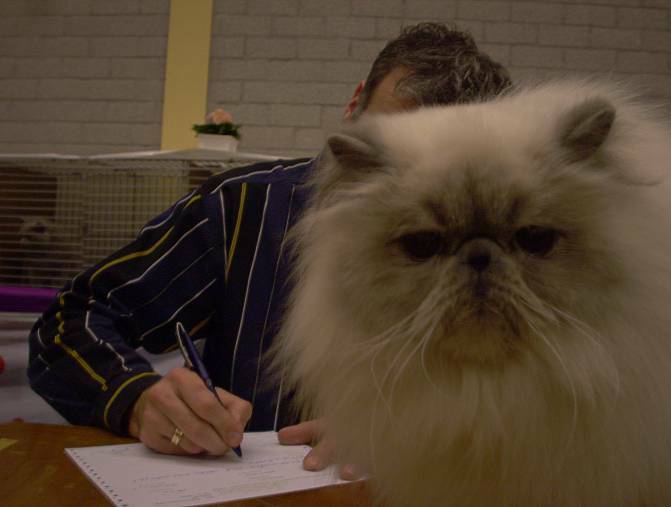 Sweet steward for our Chaty. 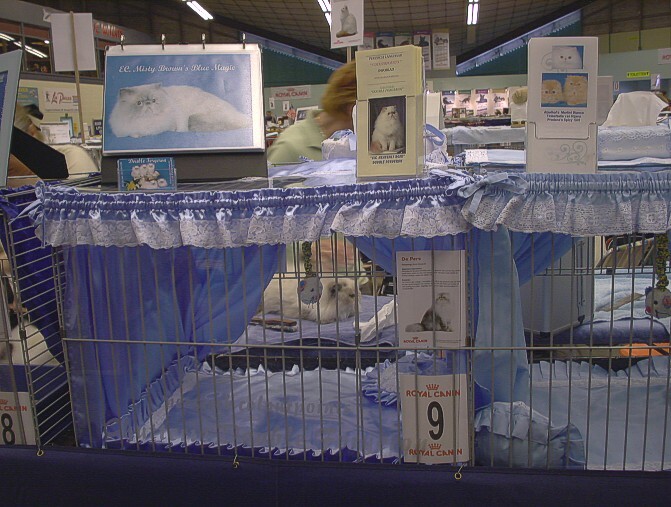 our own Piece of Cake Double Forgeron (PER a 33) "CATHY"
Cages in the blue color. 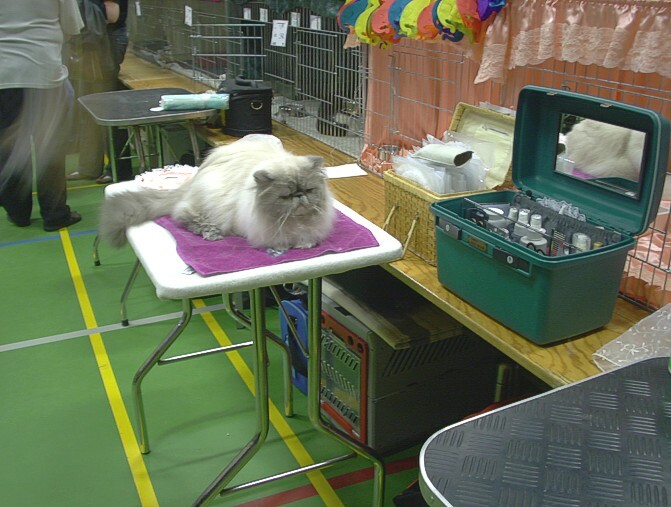 Waiting and have a lot of fun. 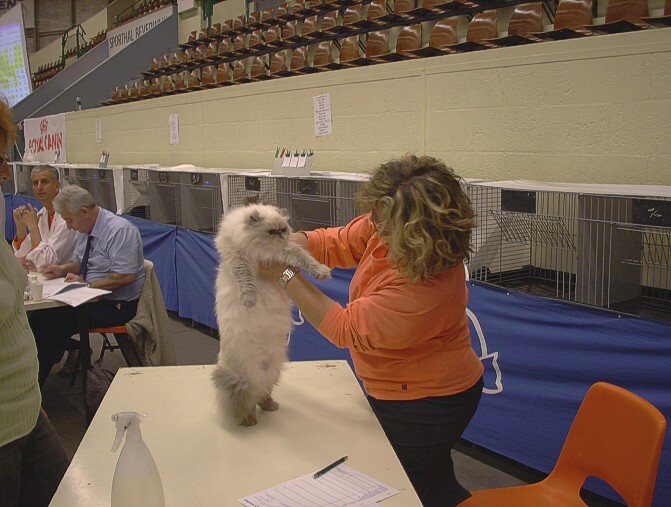 She loves Colourpoints......, her breed. 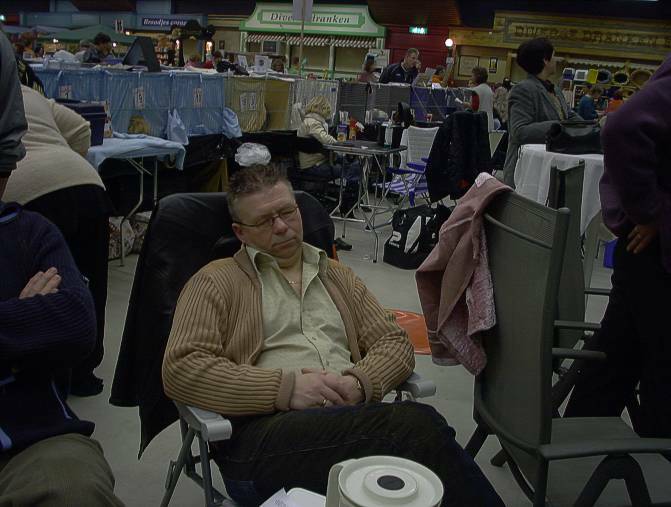 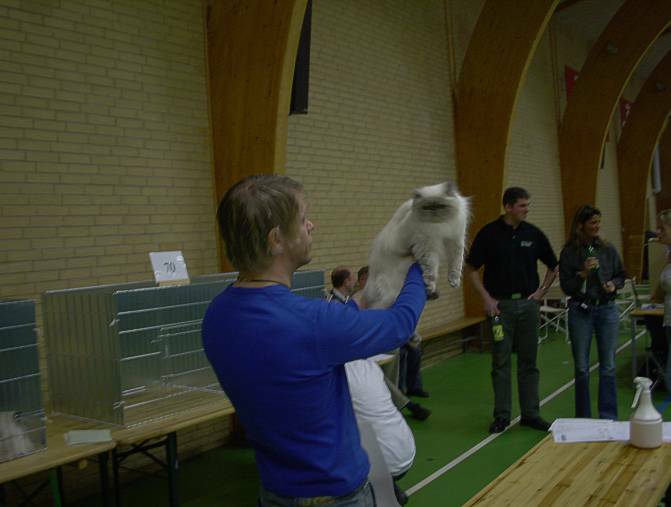 For the picture SMILE........, it was a nice weekend in Kolding (DK), with a lot of friends there. 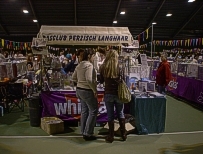 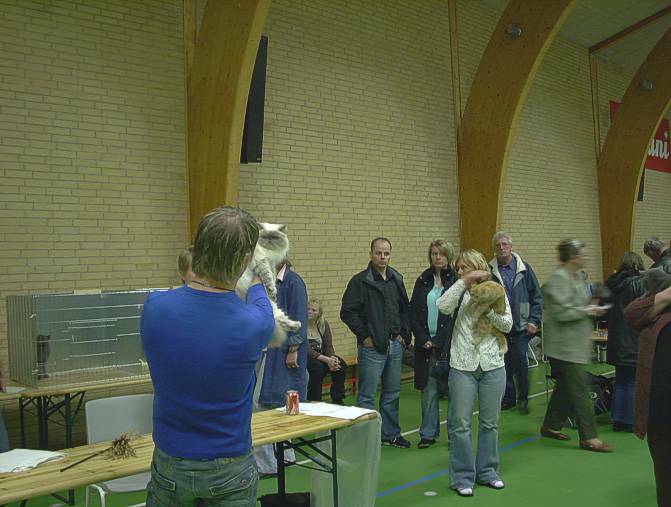 Romy is interest all the peoples on the stages. 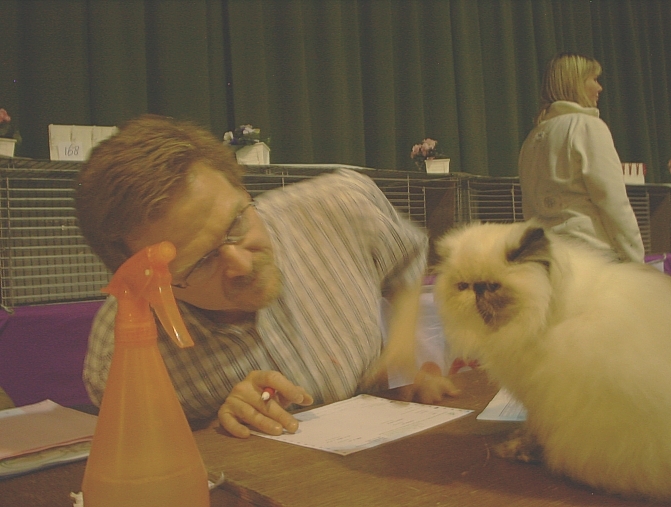 Joke and Annie, chat away plesantly. 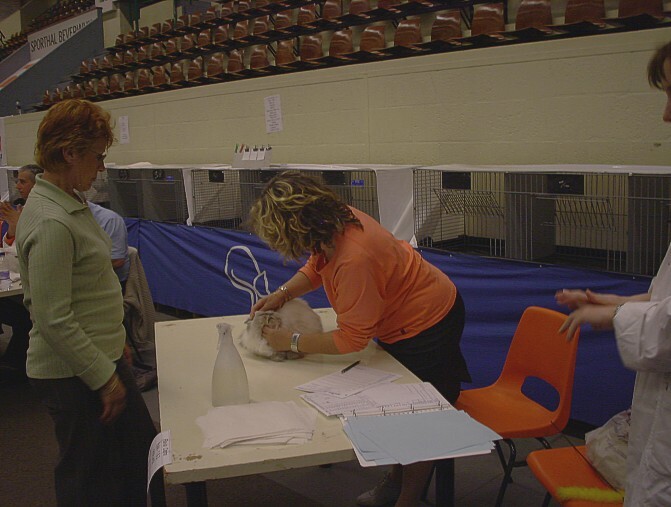 It was easy to follow the results on show. 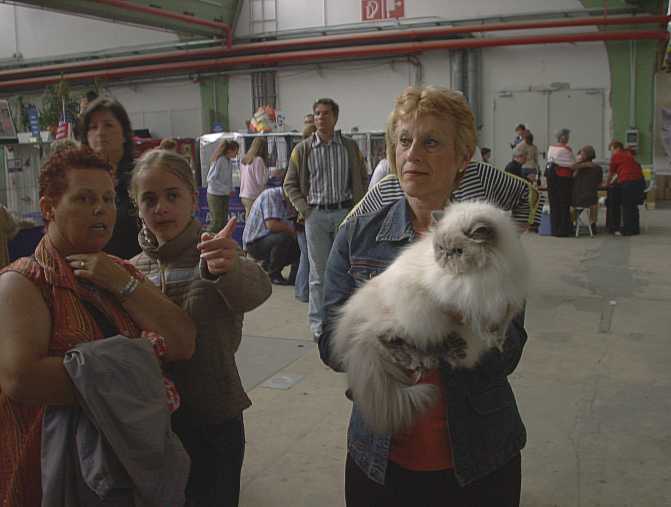 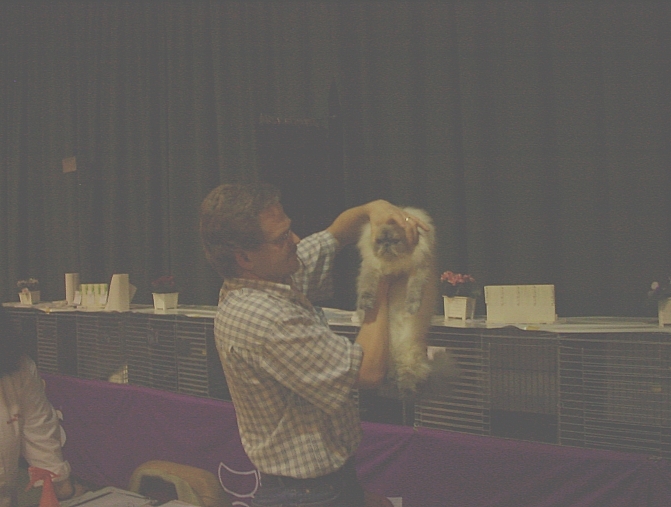 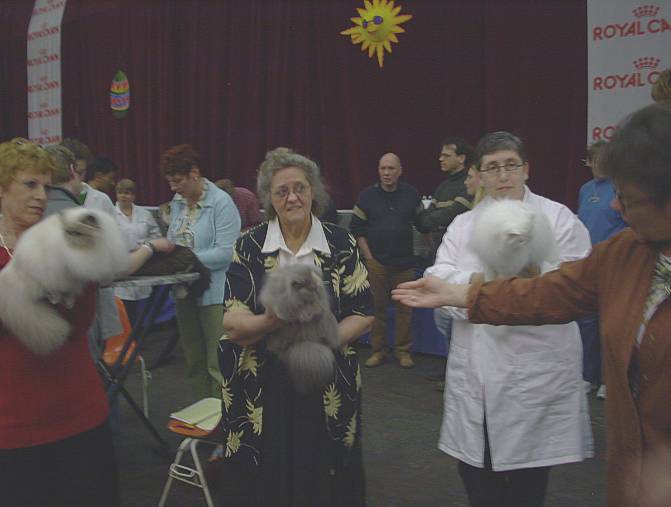 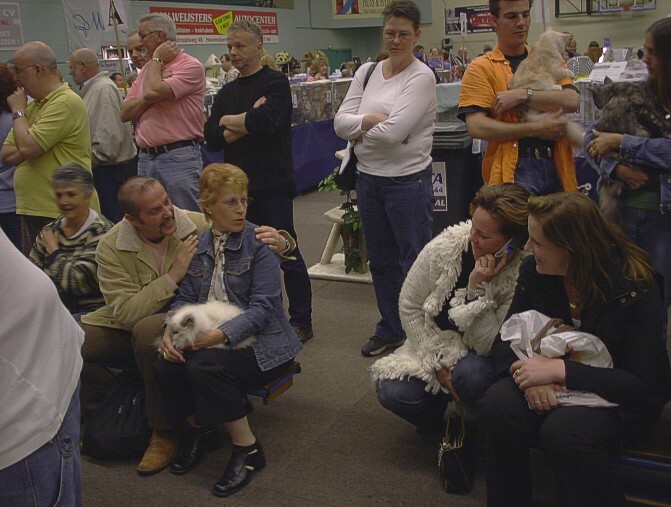 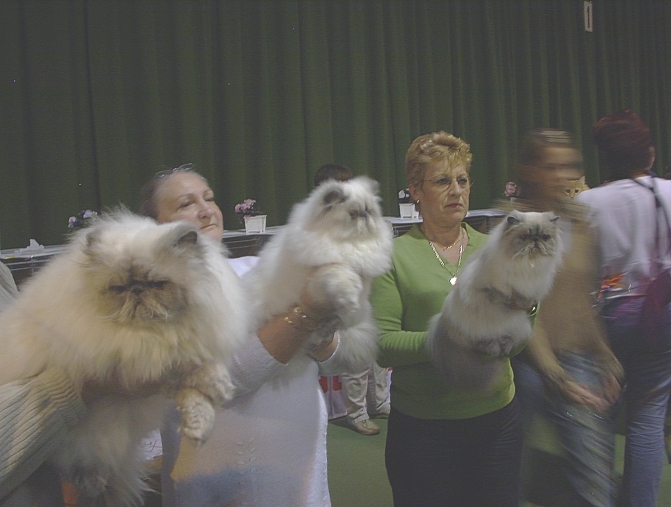 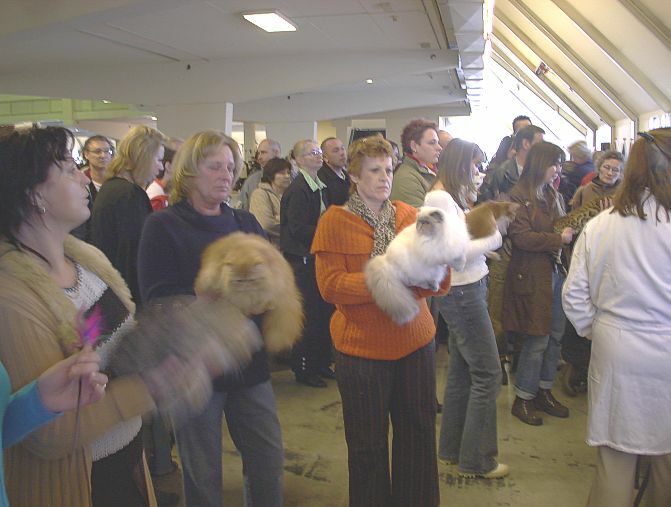 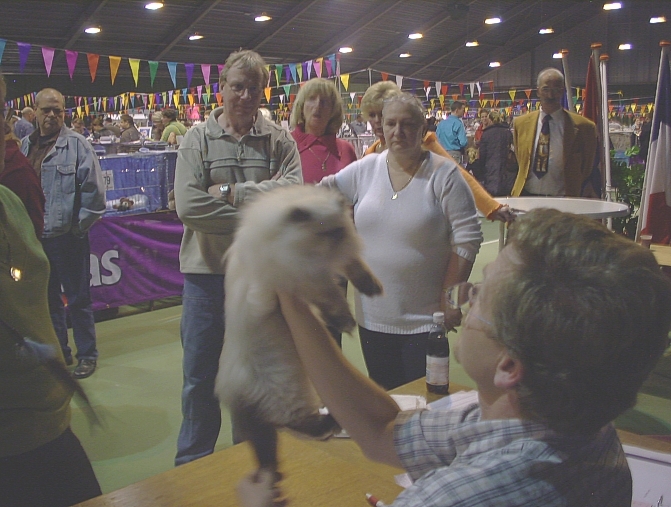 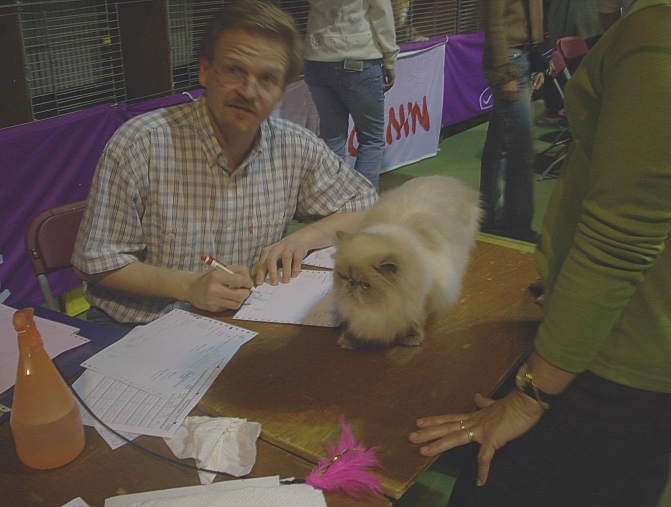 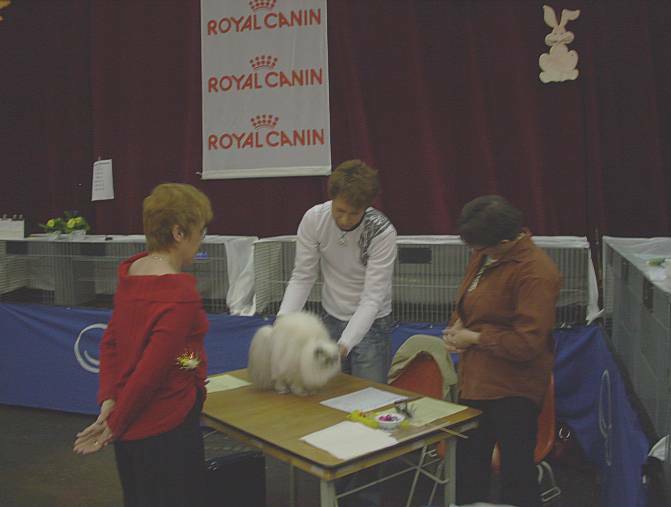 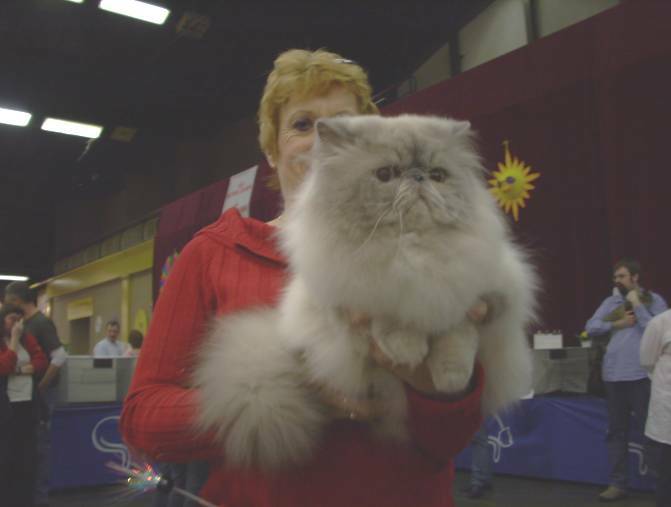 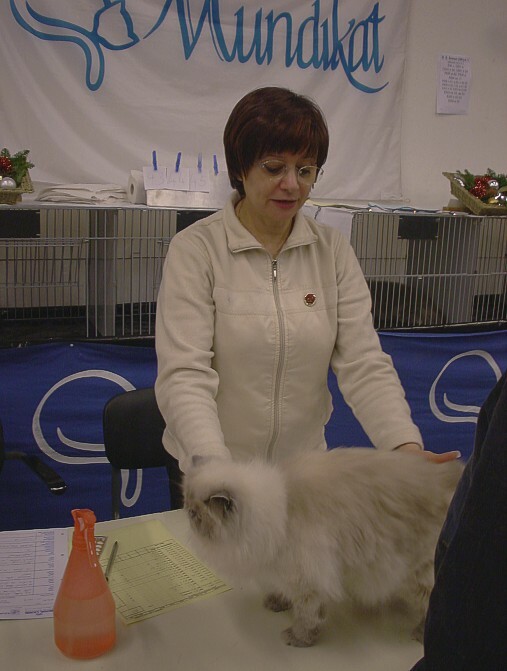 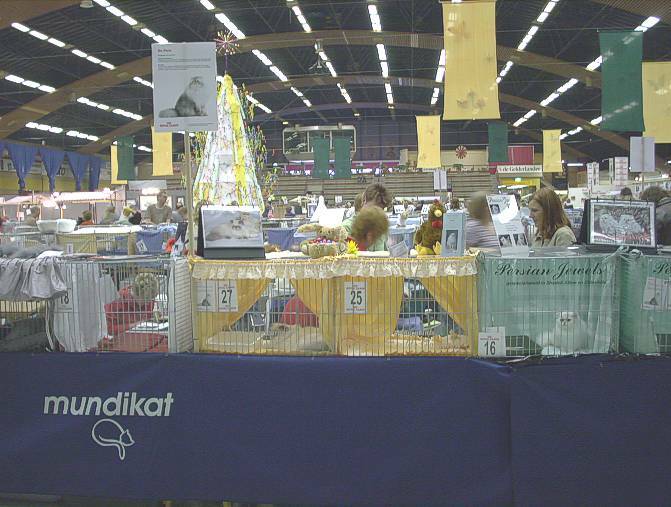 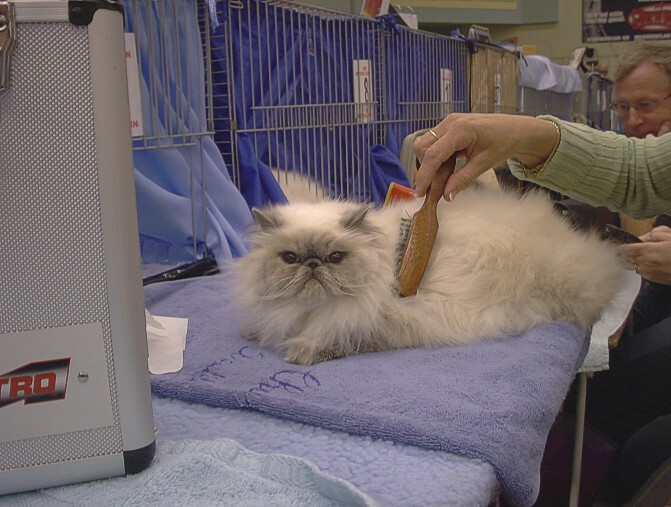 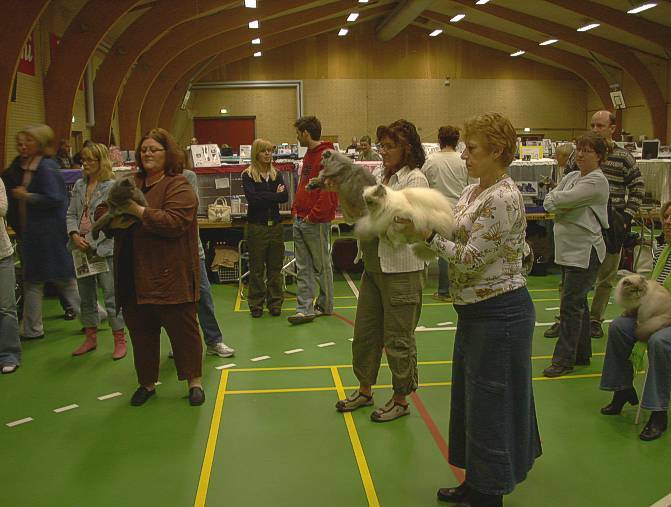 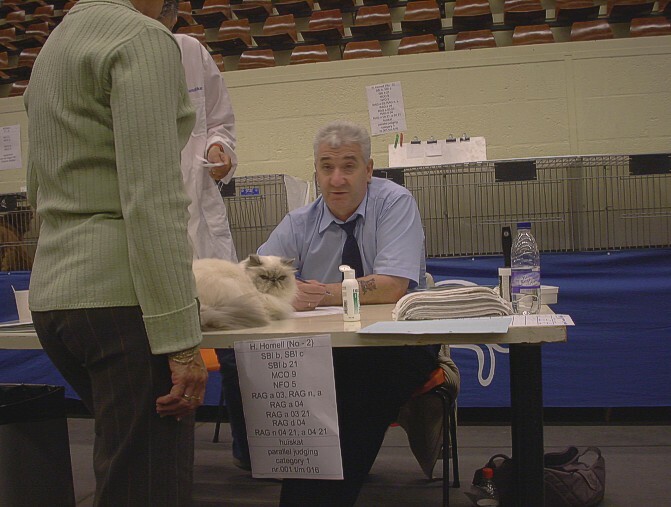 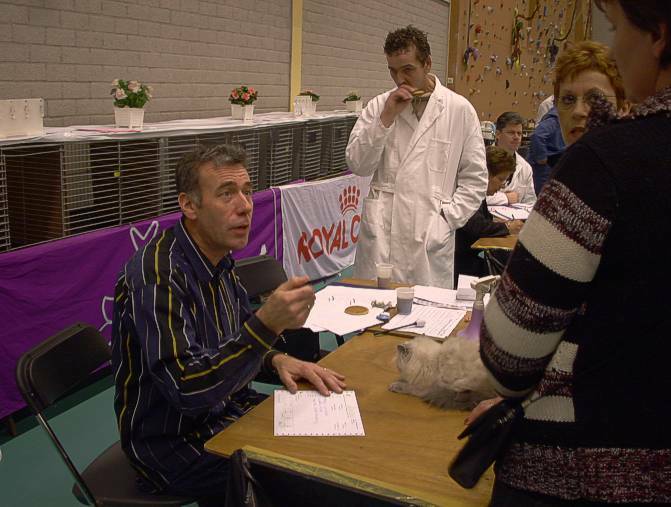 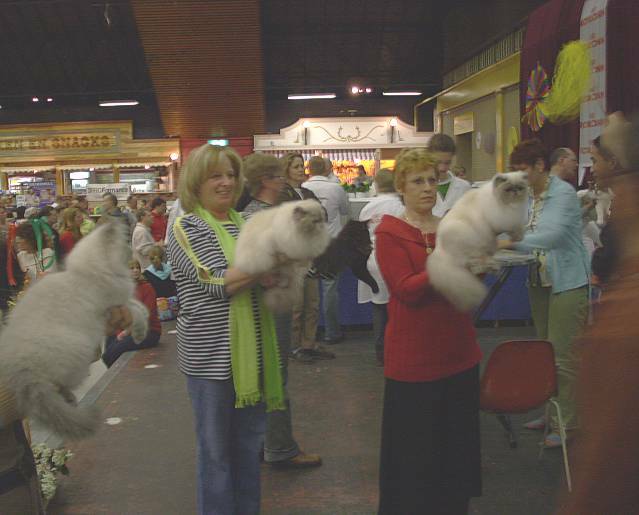 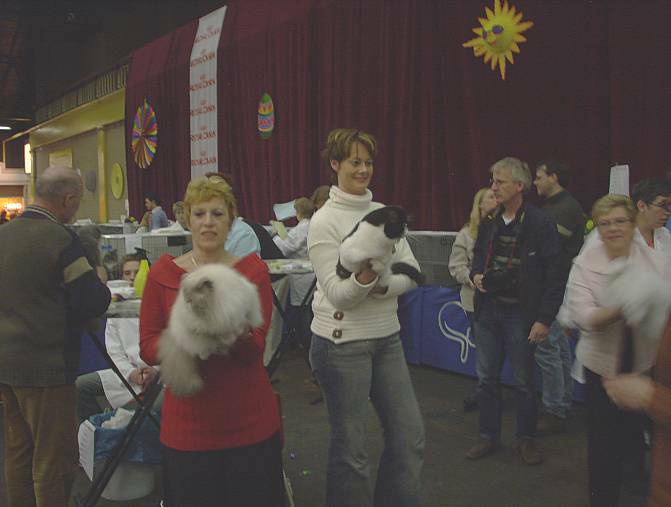 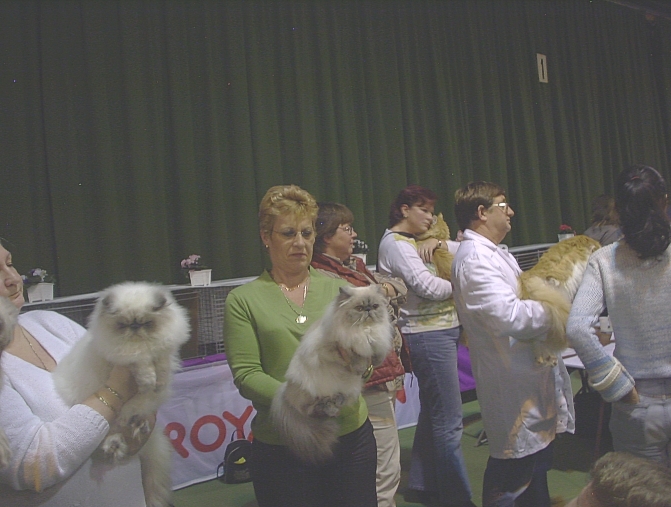 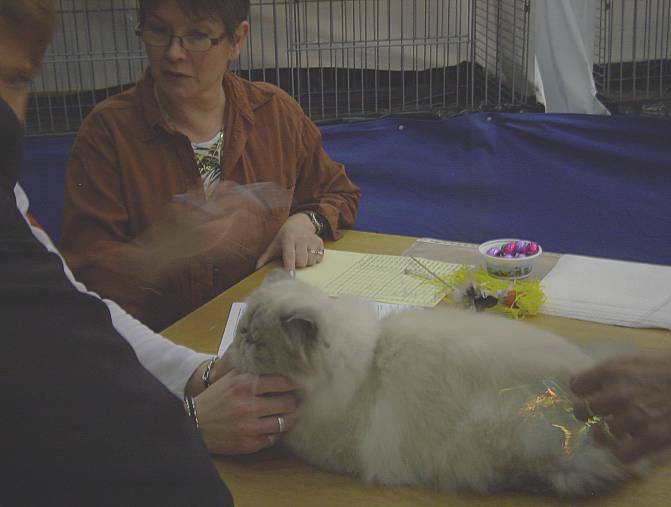 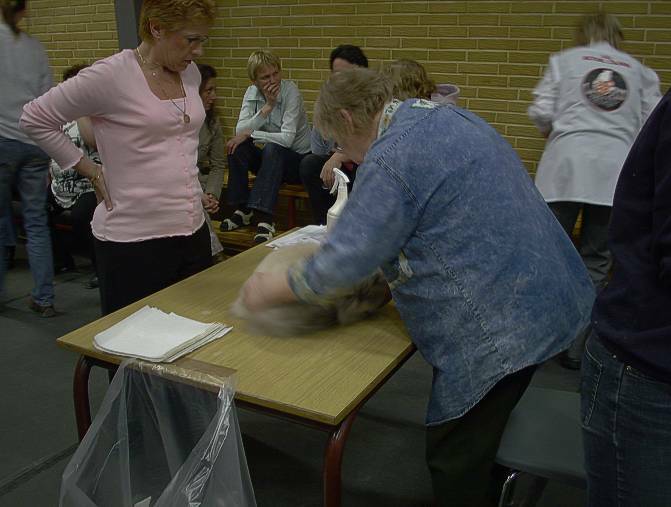 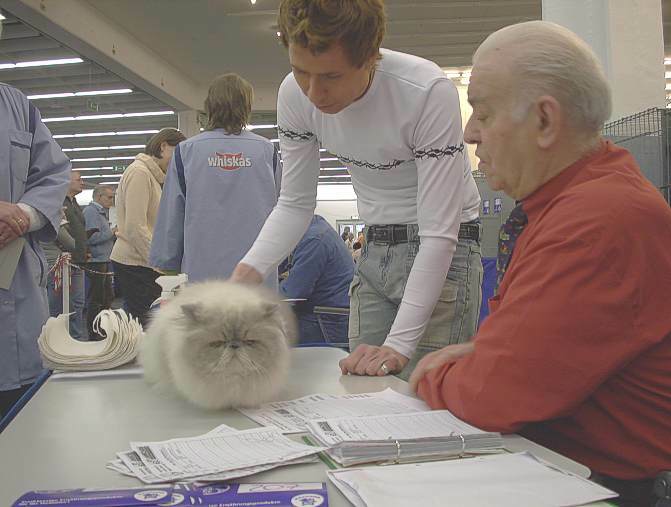 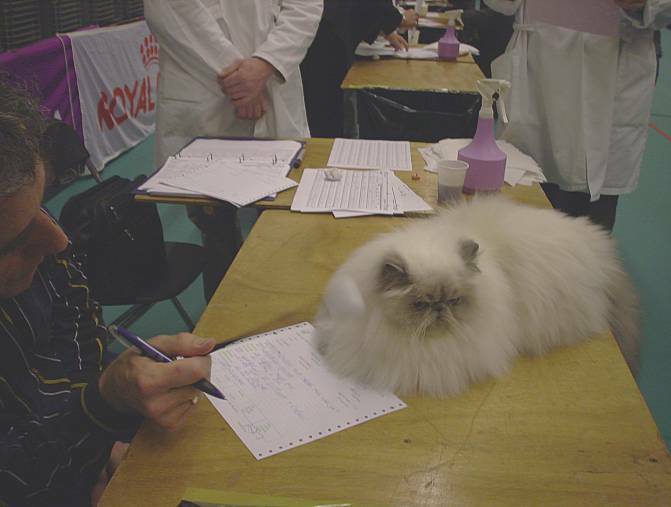 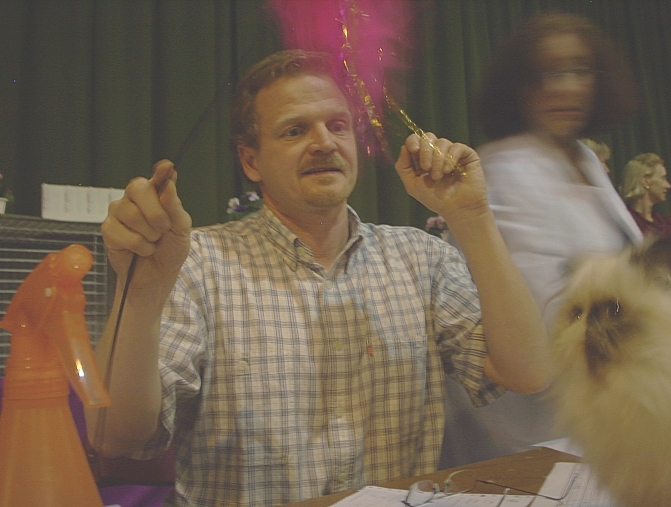 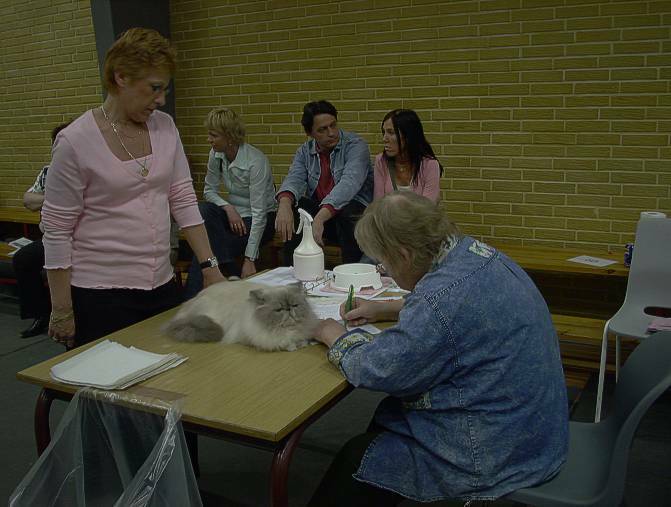 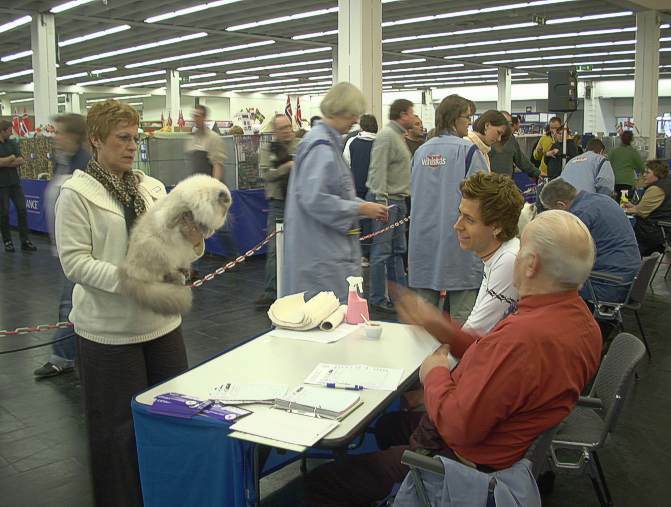 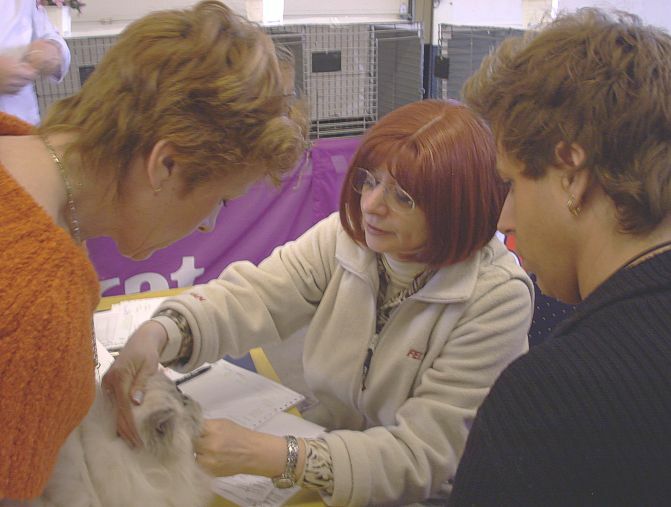 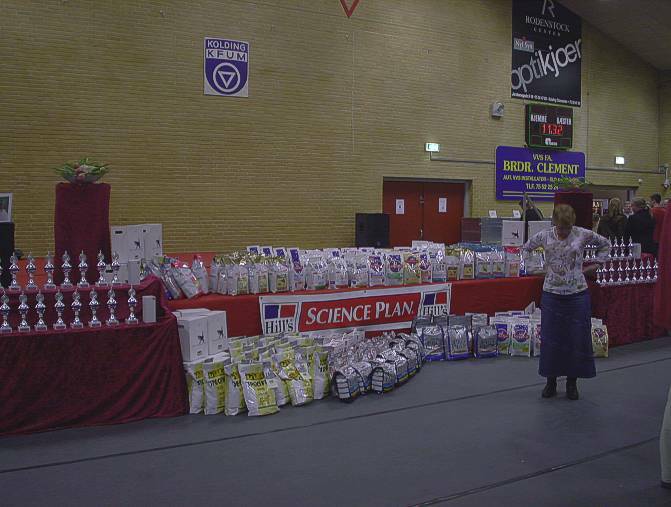 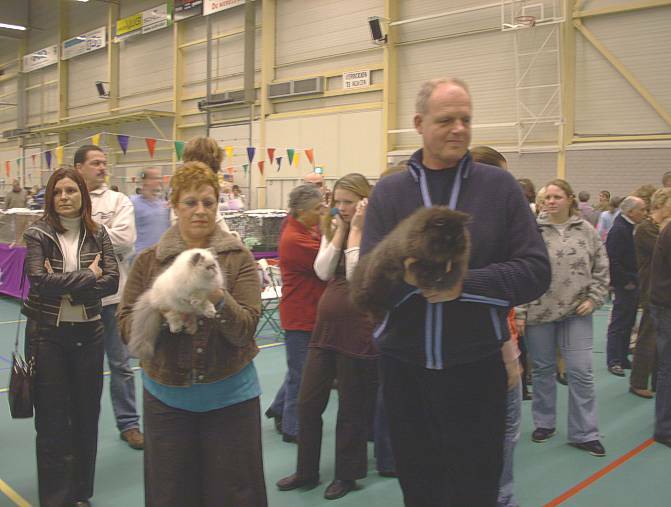 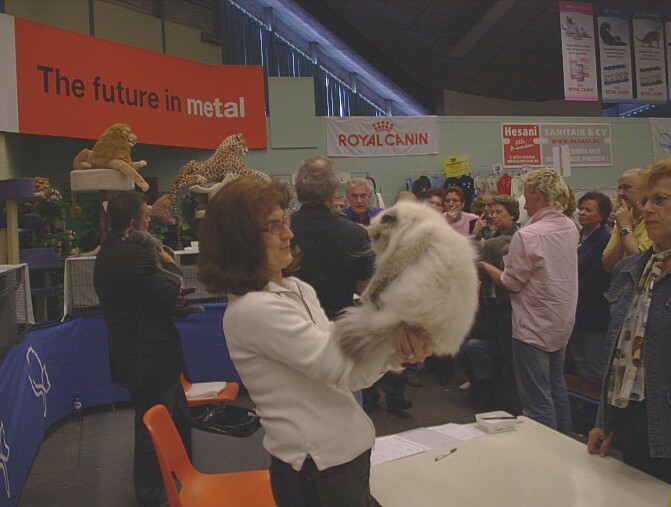 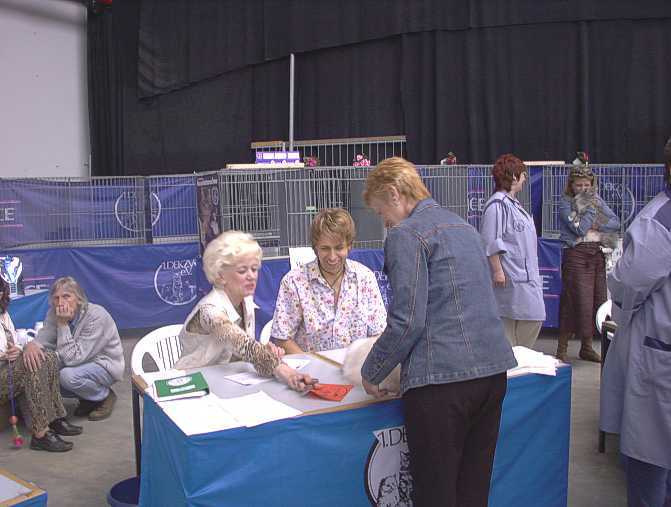 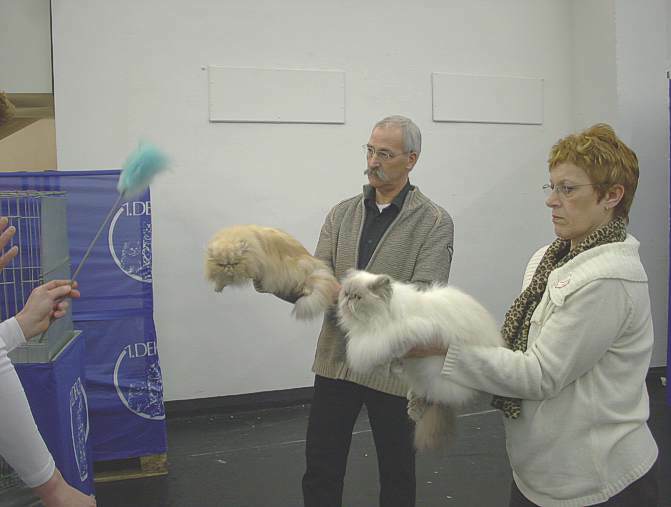 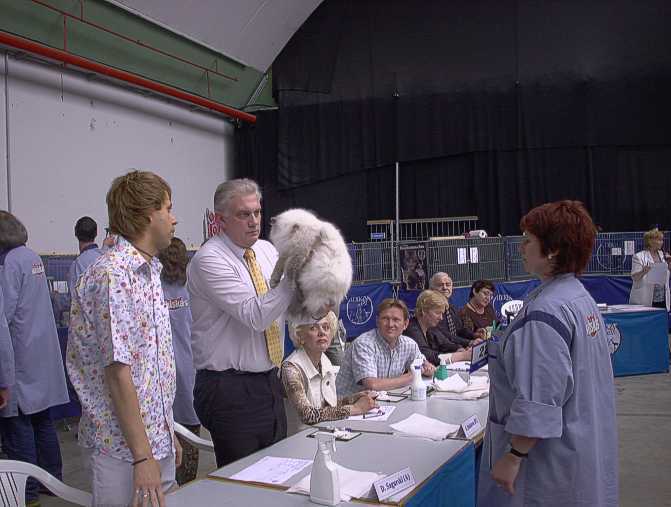 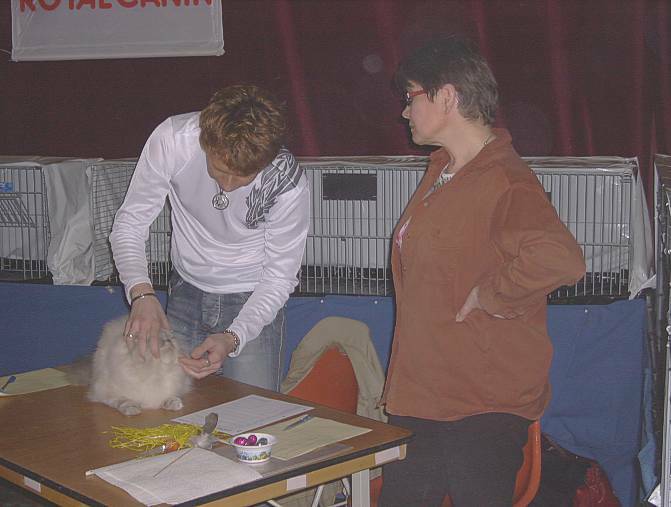 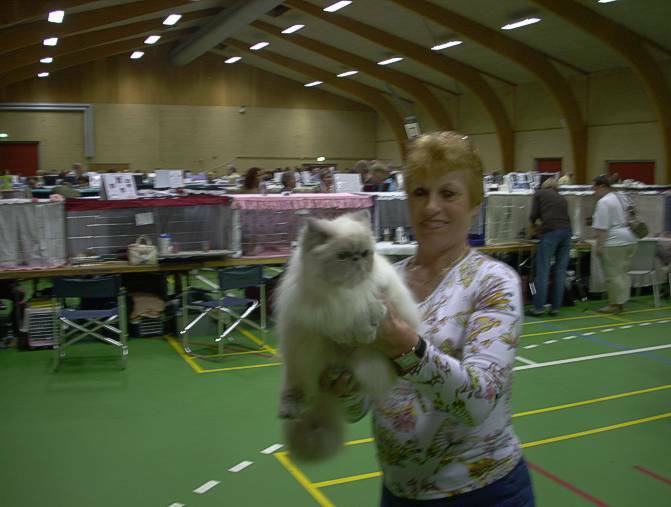 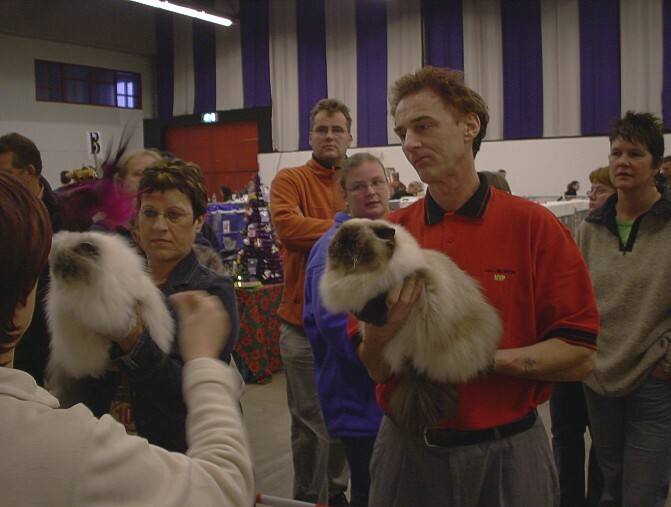 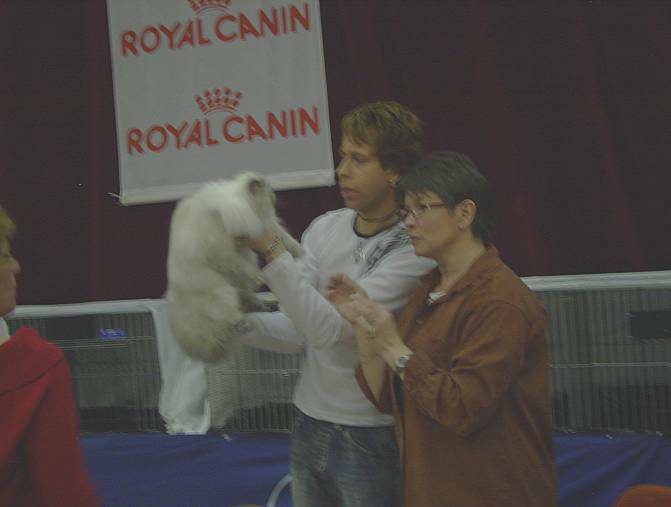 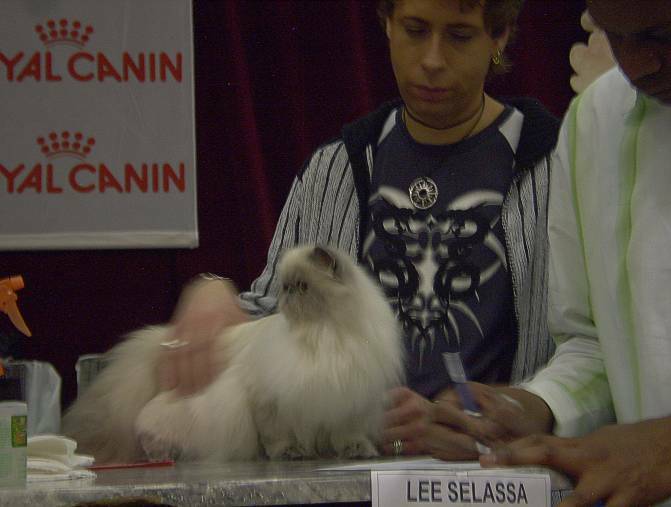 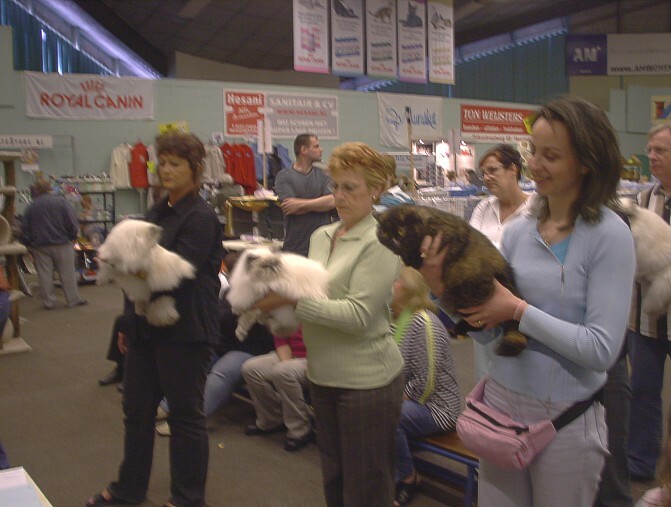 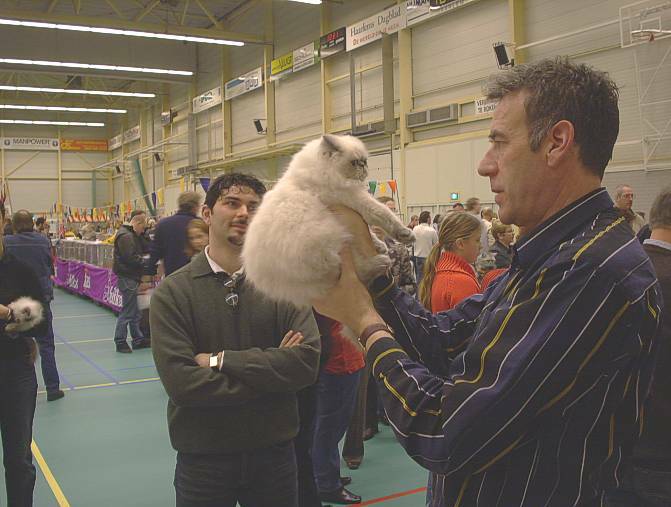 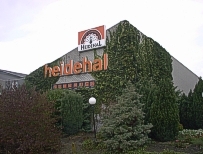 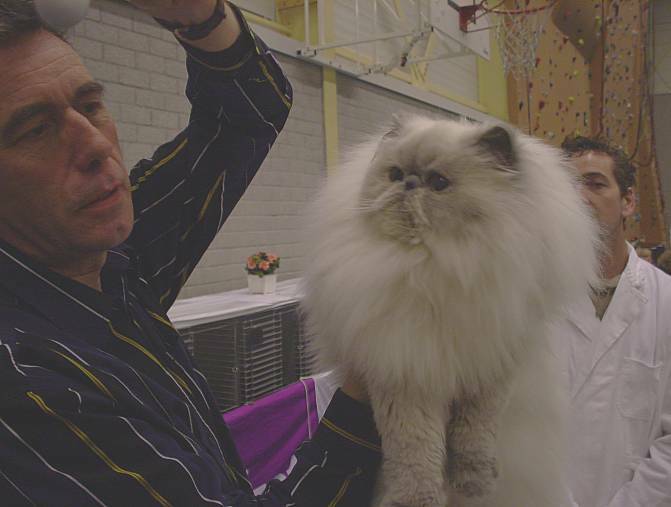 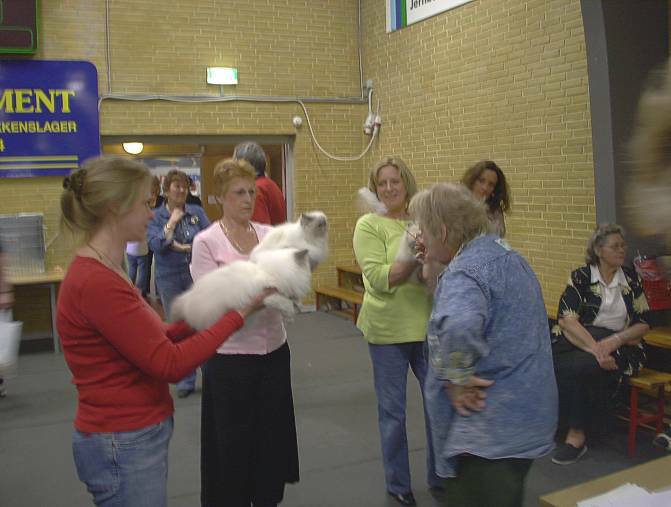 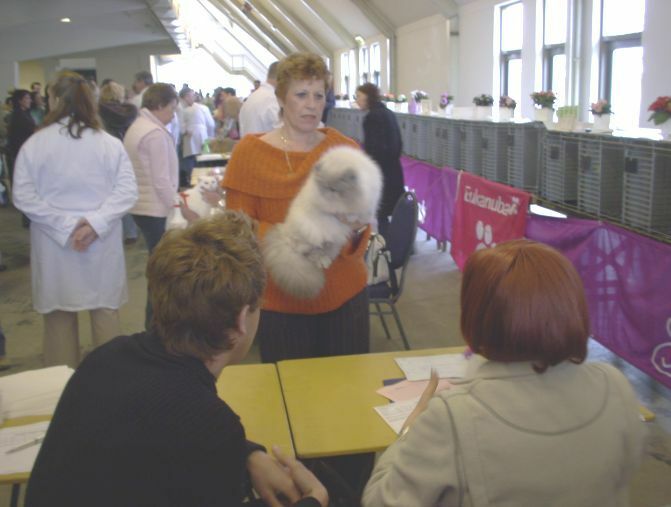 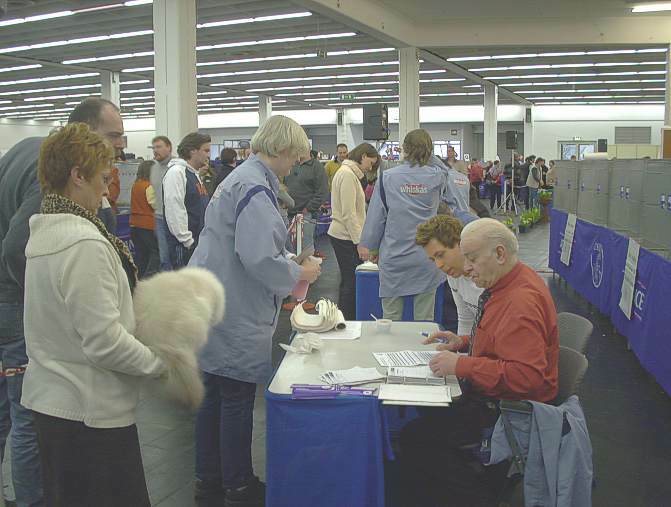 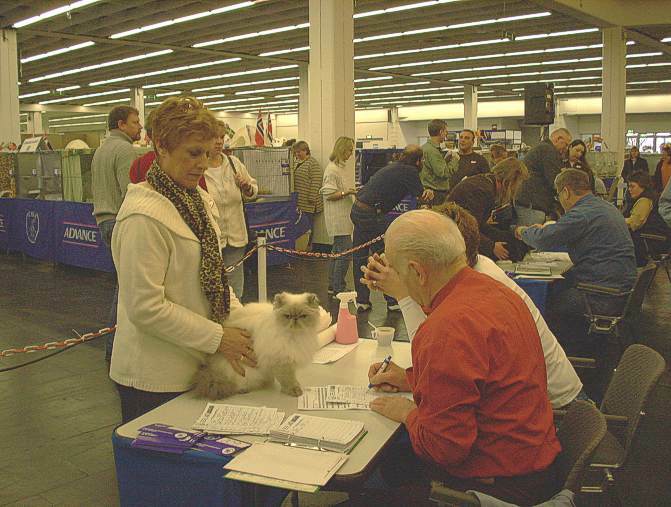 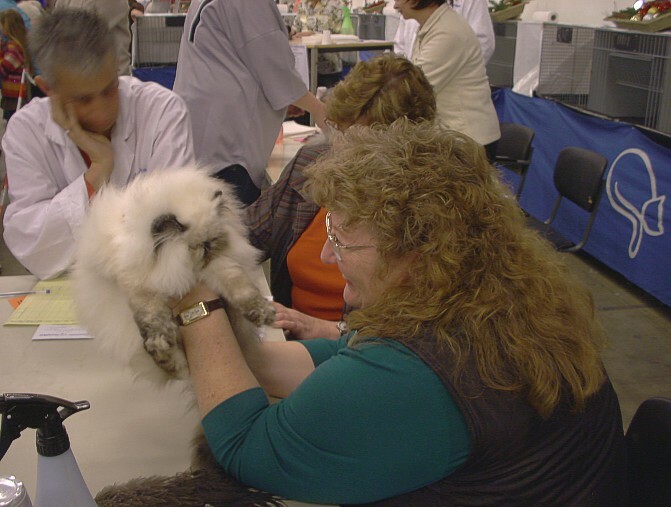 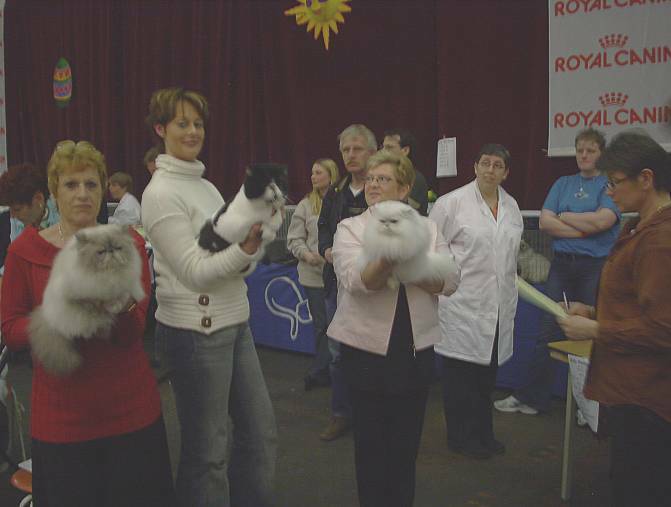 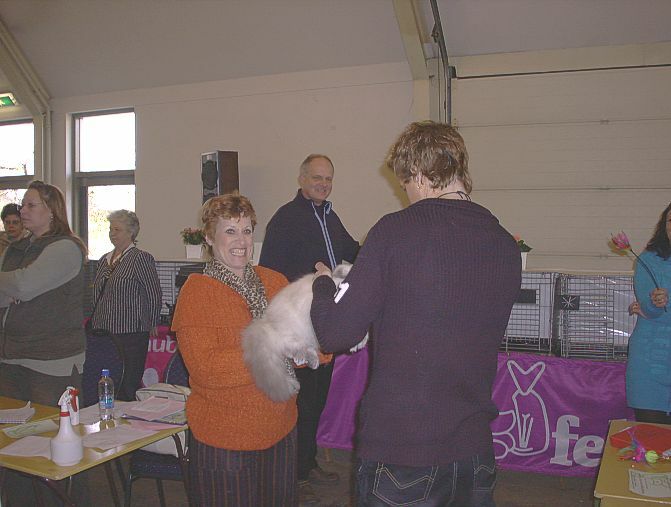 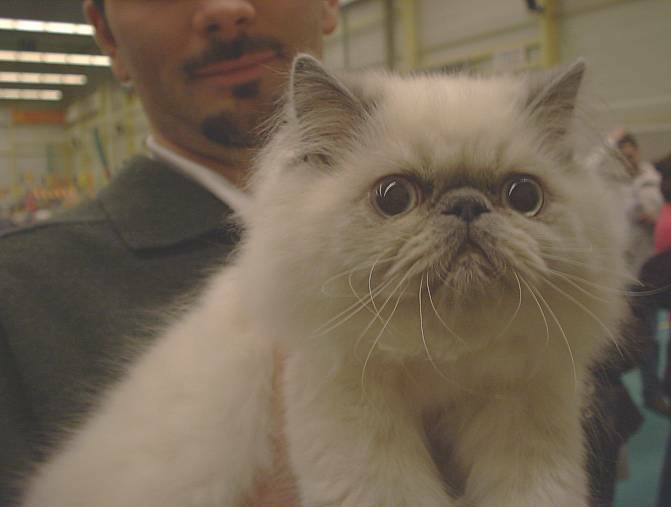 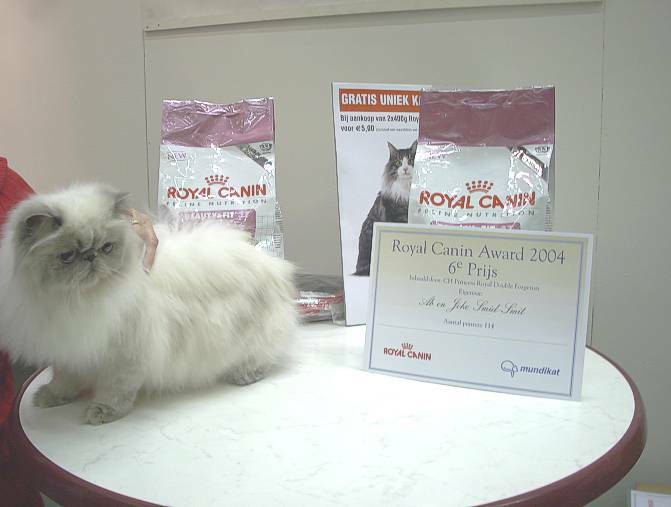 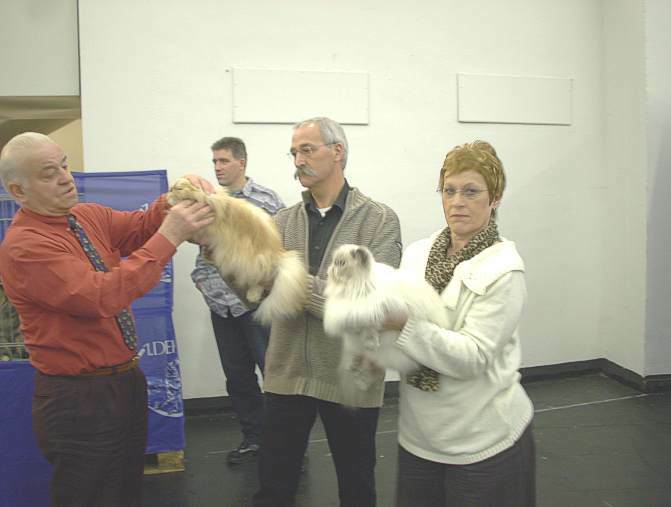 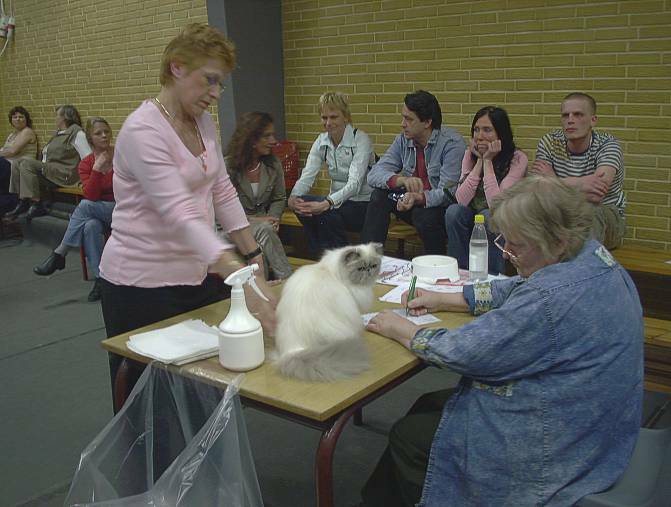 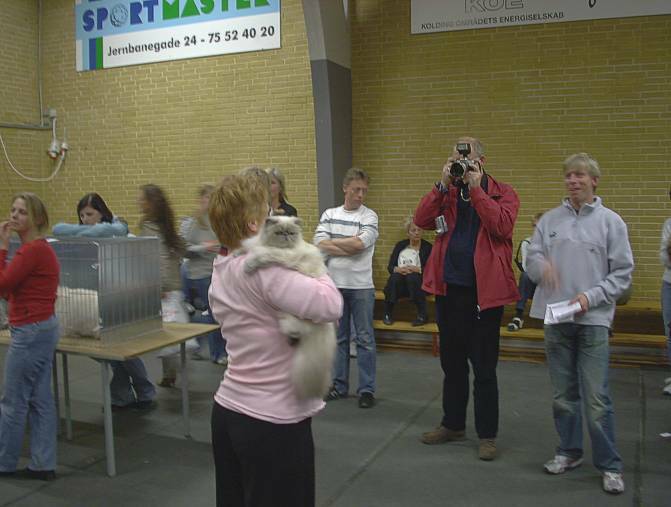 The Royal Canin Award 2004 for Ab and Joke. 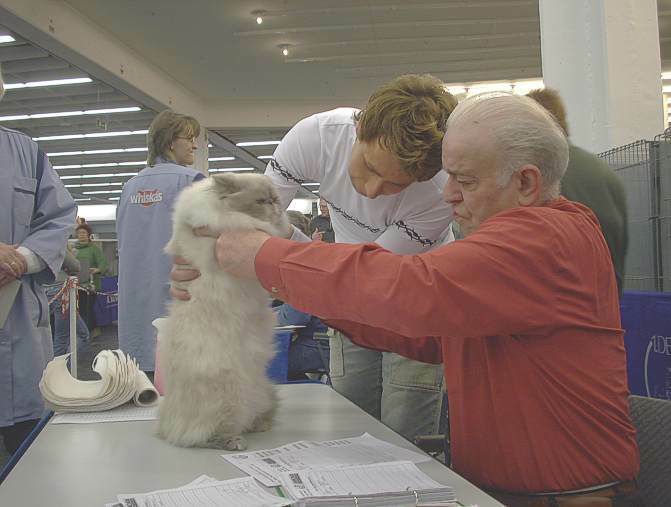 Magic by Judge Jean -Pierre Rossi(B) and Andreas Woelm(D) as pupil. 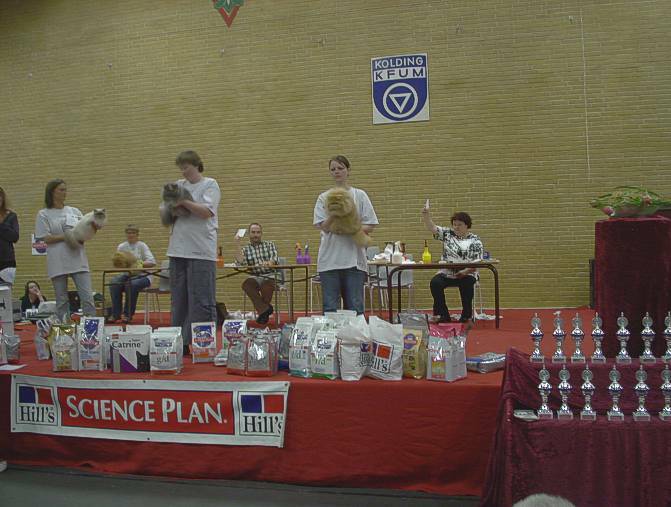 Joke present Magic to the judges. 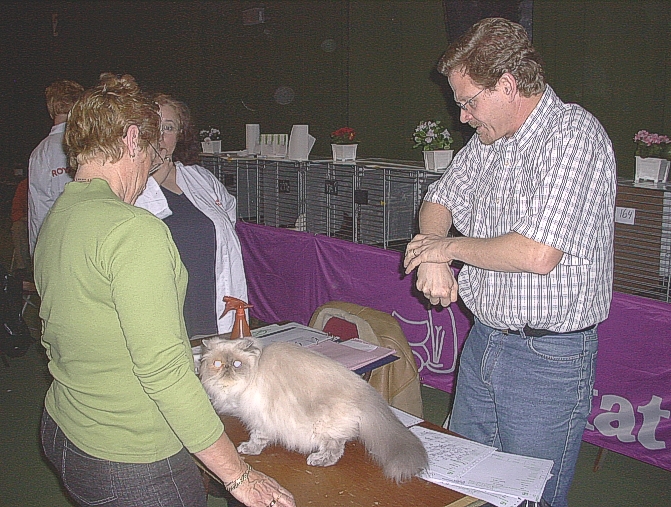 Prissy have patience and wait same with Joke. 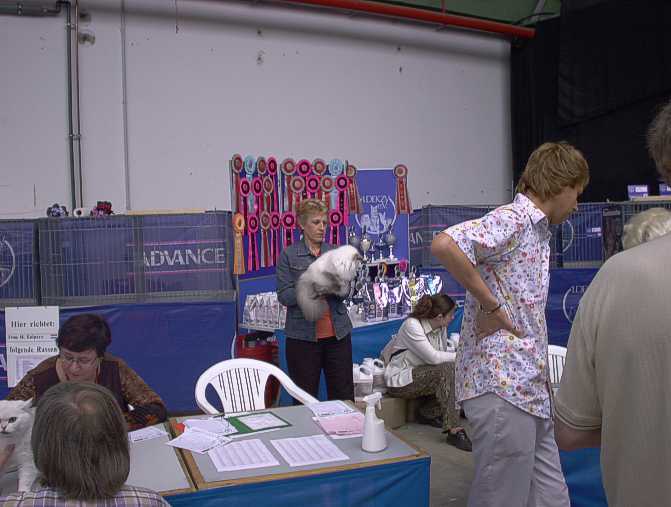 Joke give someone a hand to breeding friend. 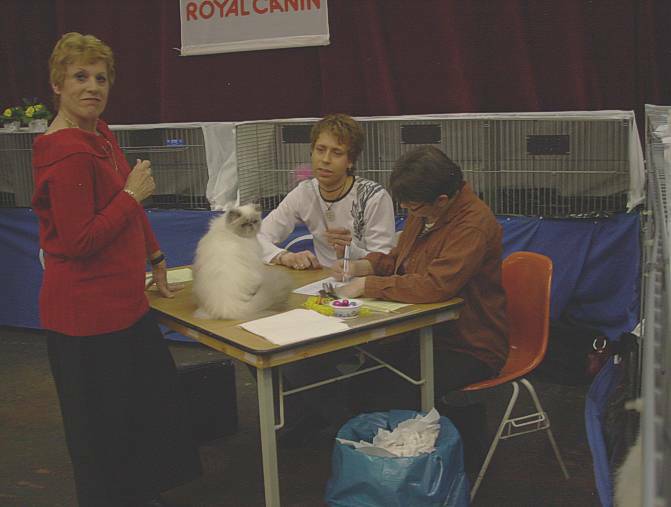 Joke with Magic waiting for judge. 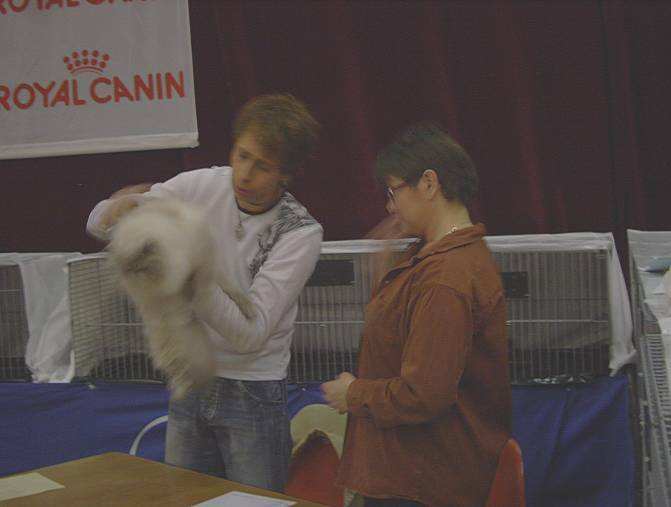 Magig present by judge Laura Burani (I) and pupil Andreas Woelm. 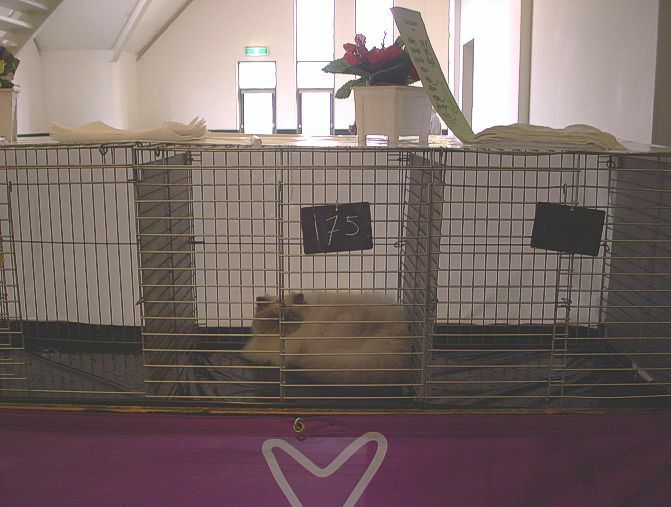 Magic get his fifth CACE! 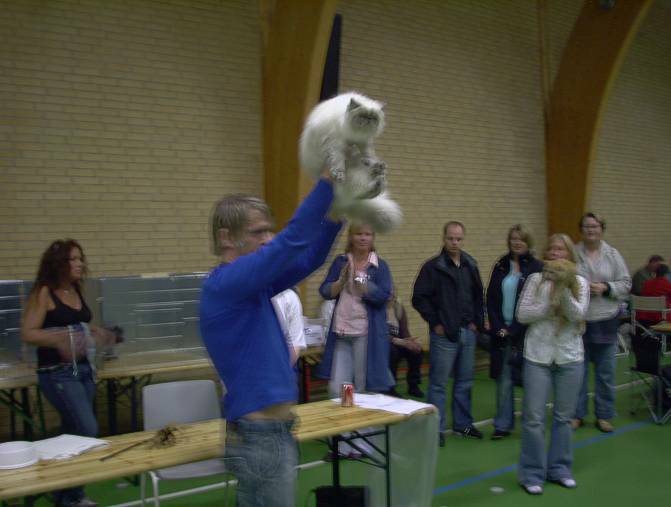 We had a very busy day, we forget to make pictures of Magic by Judge. 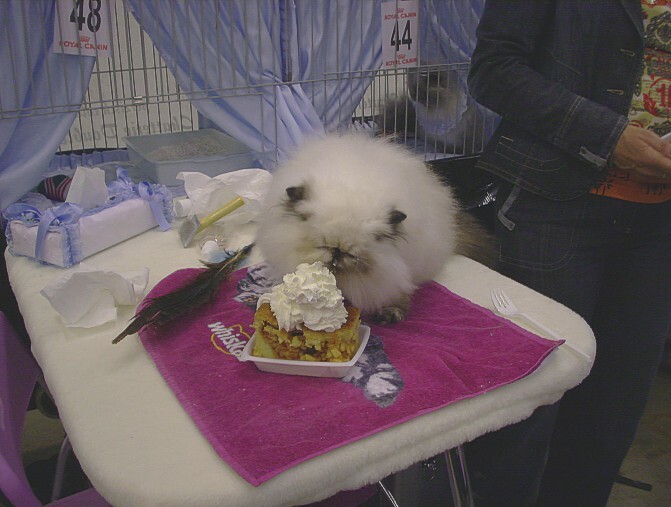 He got his fourth CACE. 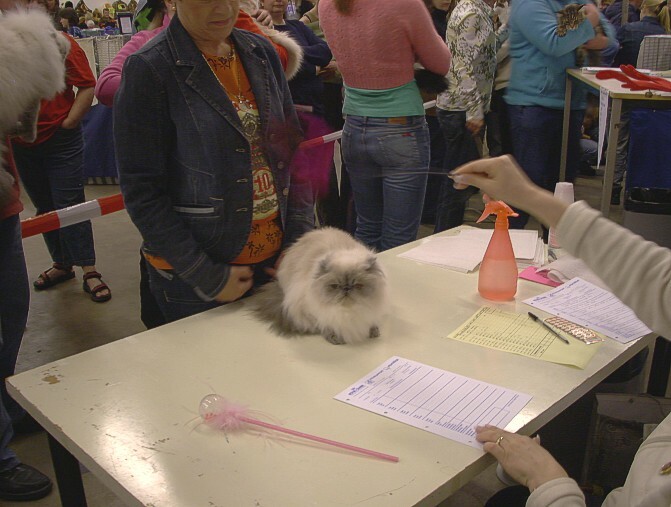 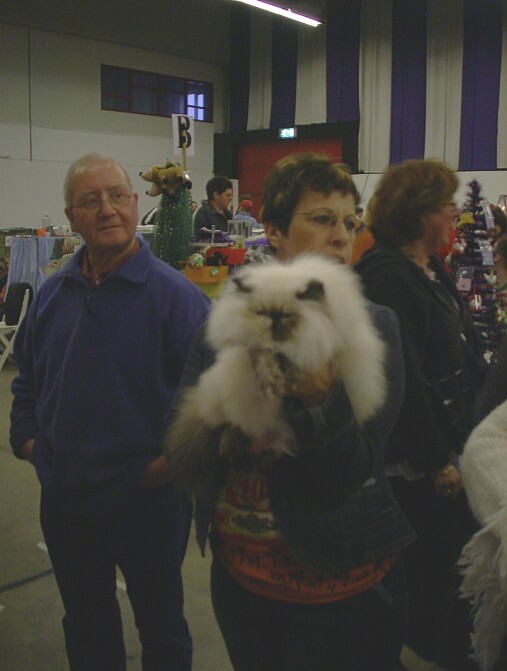 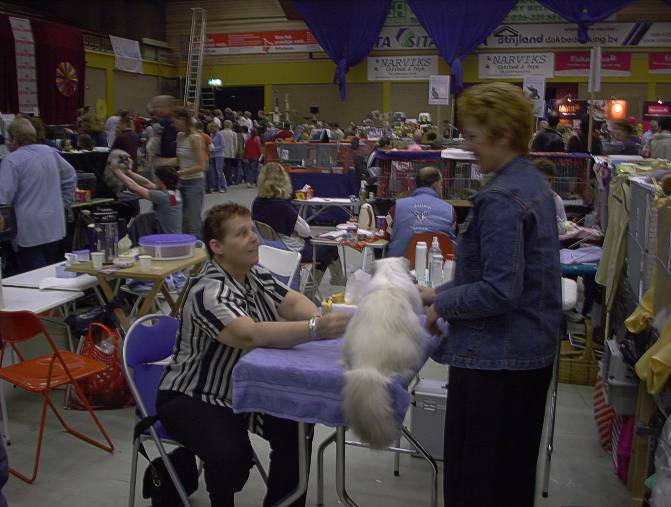 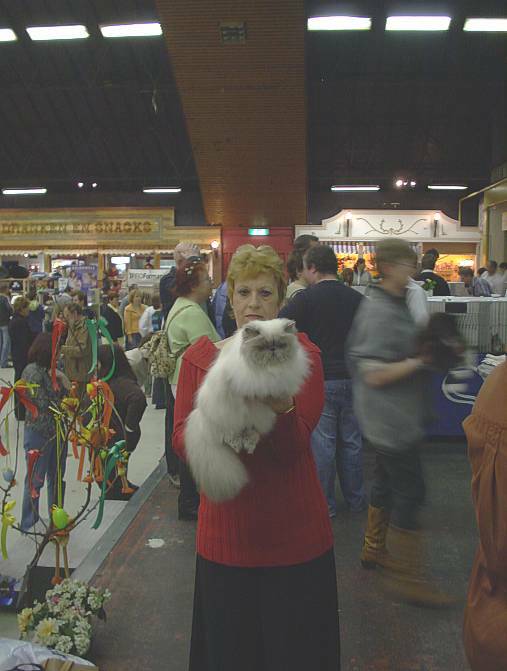 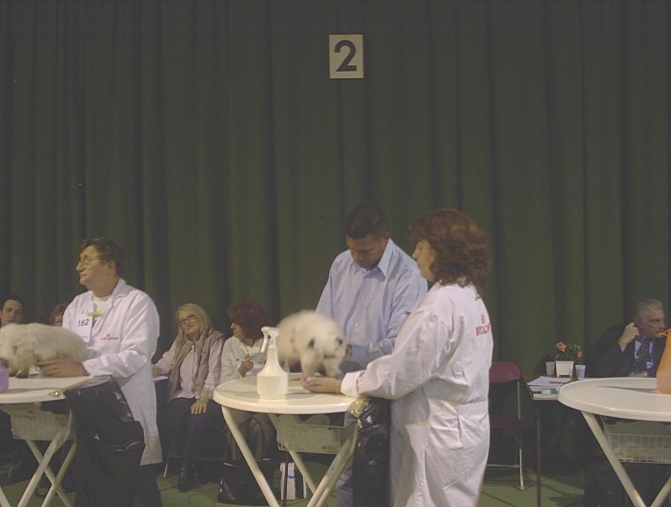 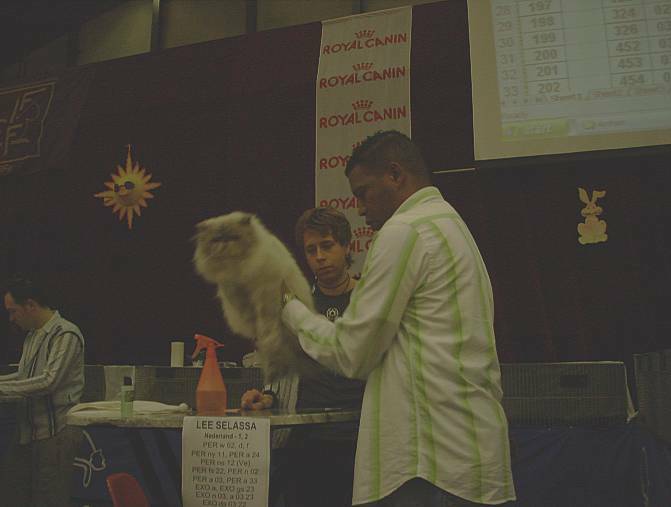 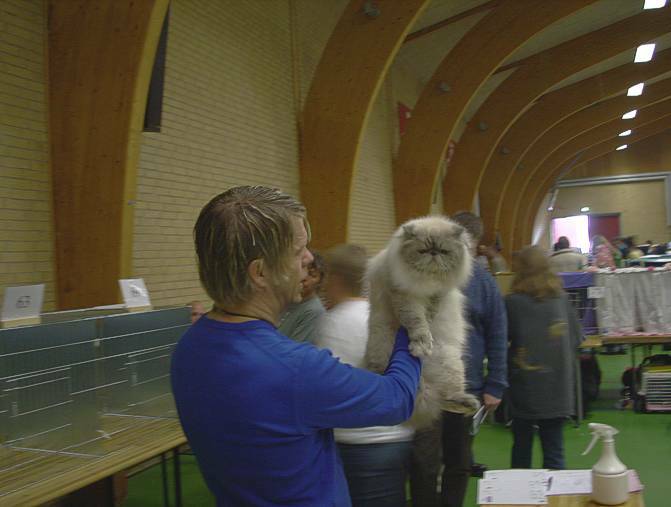 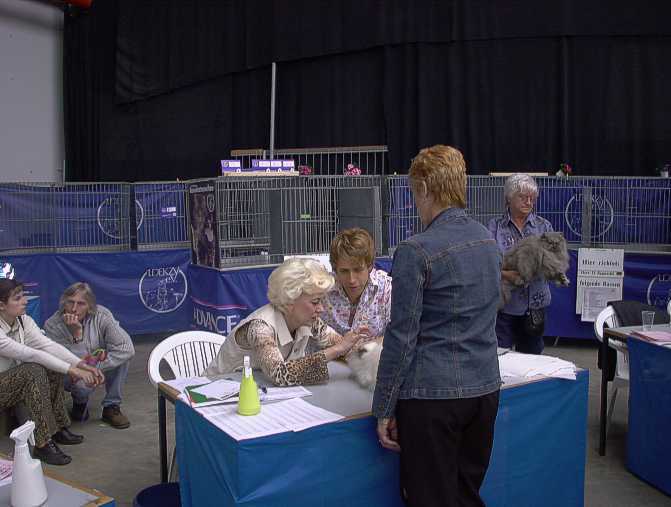 Prissy on table by Mr Ad de Bruijn, Judge from Holland. 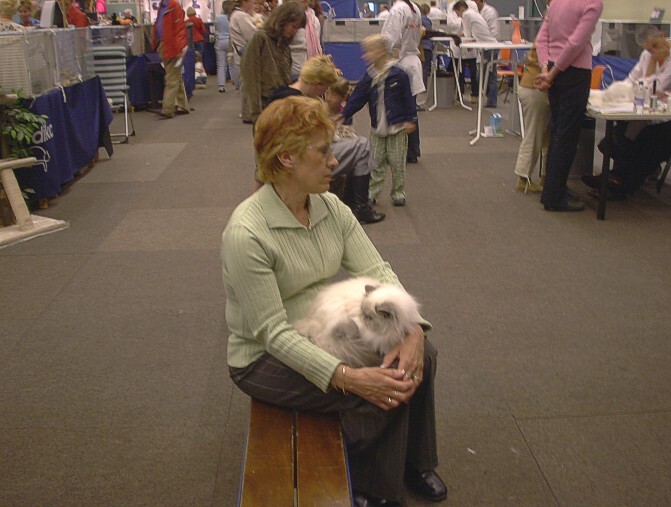 Ellen waiting with Prissy, so that Ab can make a picture from the Double Forgeron's. 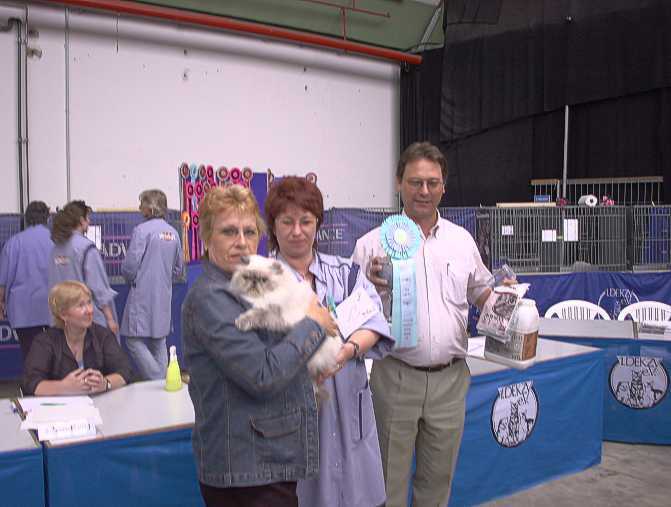 Anna from Latvia with Glory, Alexandra and Nicolas from France with Super Duper. 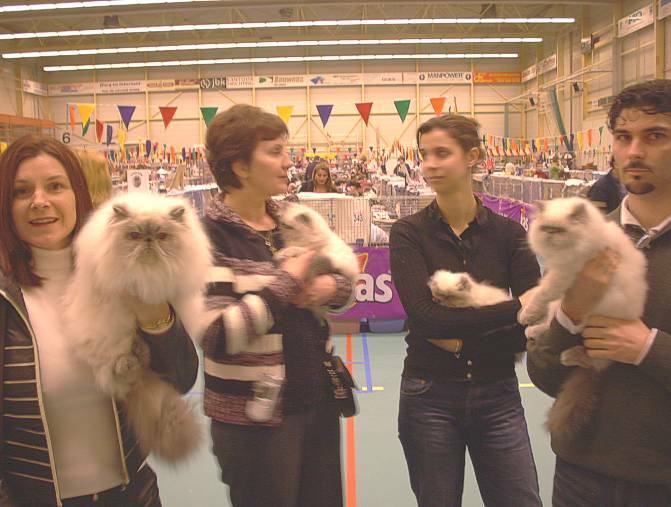 Super......., Super Duper, get the Best in Variety (BIV). 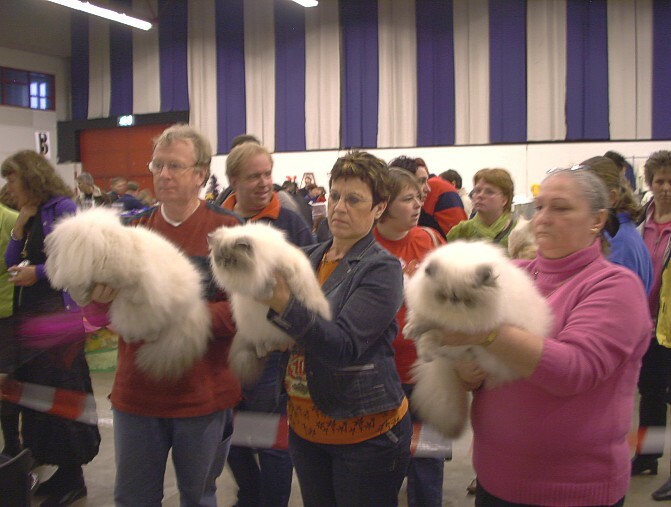 Glory by Judge Ad de Bruijn, Joke and Anna are waiting. 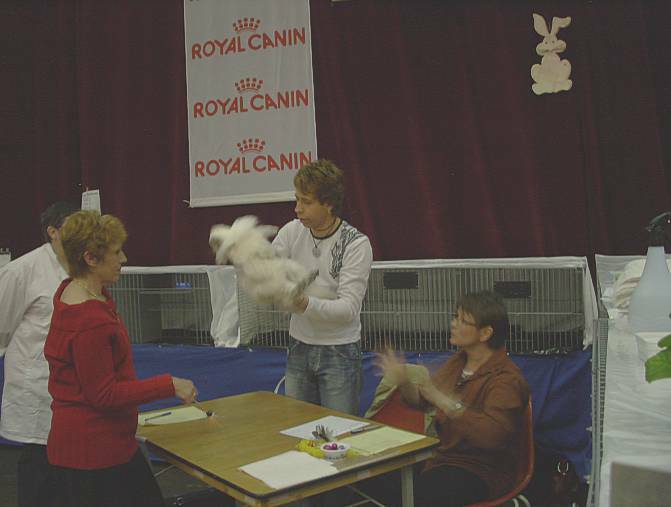 Judge explain some things to Anna and Joke. 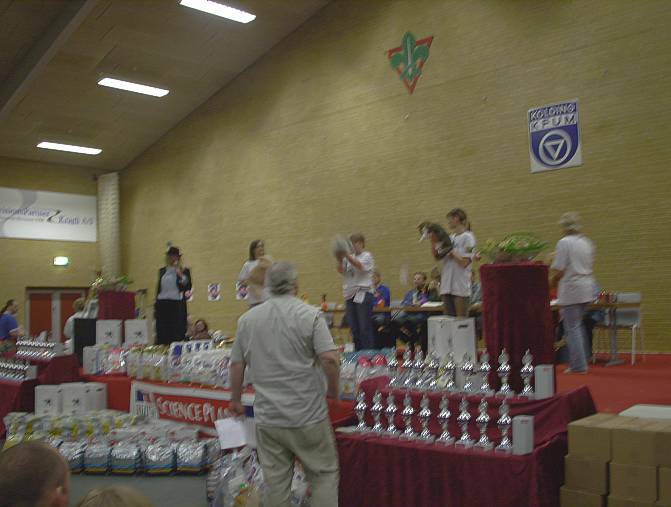 Super Duper for Nomination, but beated.